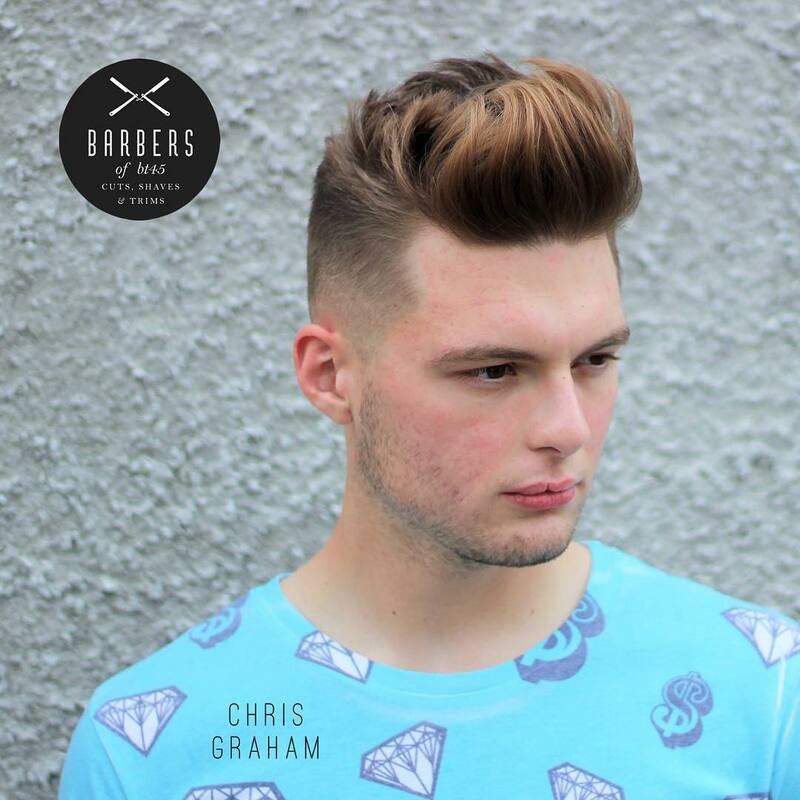 And so, we present the Men’s Hairstyle Trends guide to the top 100 men’s hairstyles. 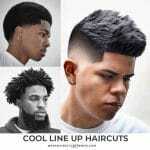 With each new year comes a brand new collection of modern haircuts for men and fresh men’s hairstyles. 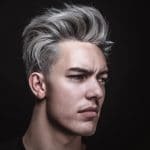 Over the last few weeks we have looked at thousands of the latest hairstyles and haircuts coming out of the best barbershops and hair salons worldwide. 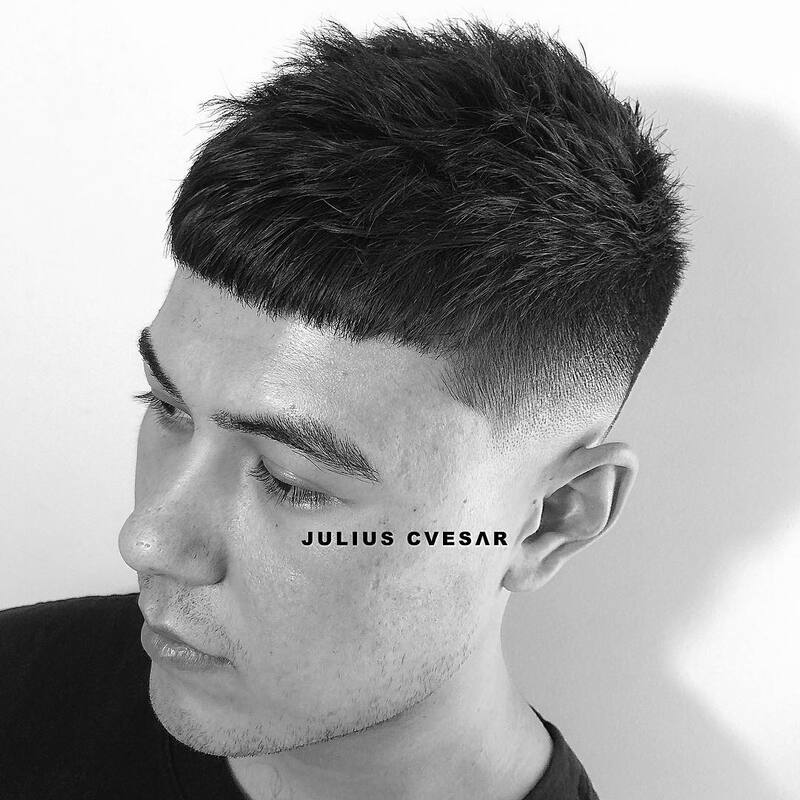 The barbers, hairdressers, and stylists we have featured below totally killed it in each and every cut. 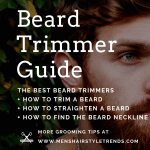 This guide gives you a plethora of new hair ideas and will keep you looking strikingly polished. 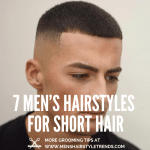 The haircut styles in this guide are organized from shortest to longest in hair length and include options for all hair types. 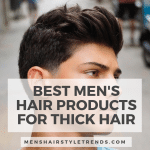 We explore what are the best hairstyles and haircuts for thick hair, curly hair, wavy hair, straight hair, and how to style them all. One final thing to consider before we get started. 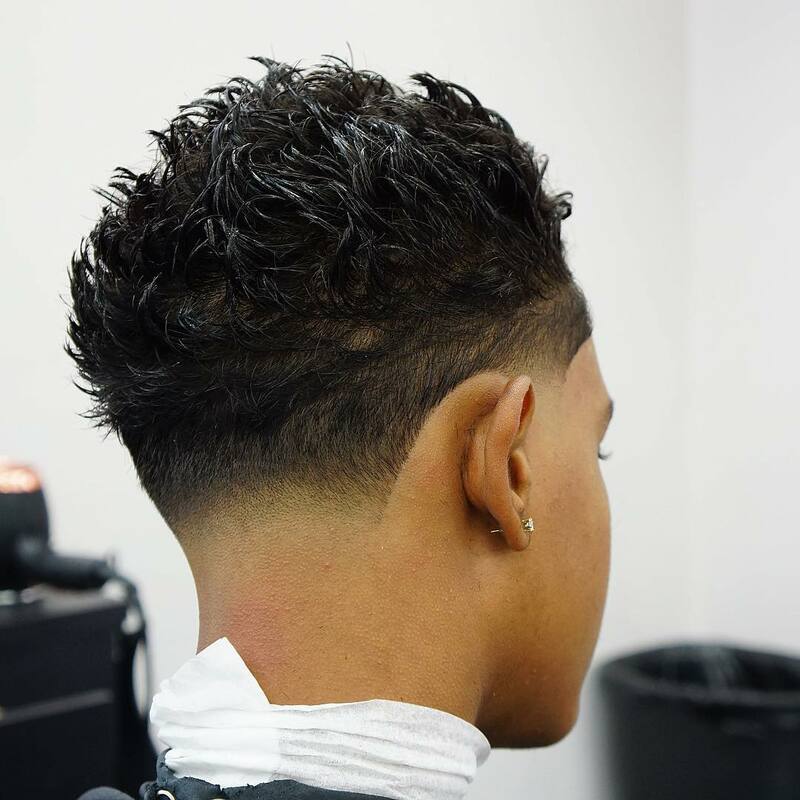 This is a very busy time of year, so be sure to get in to see your barber or hairdresser soon so you can look great for the upcoming holiday and party season! 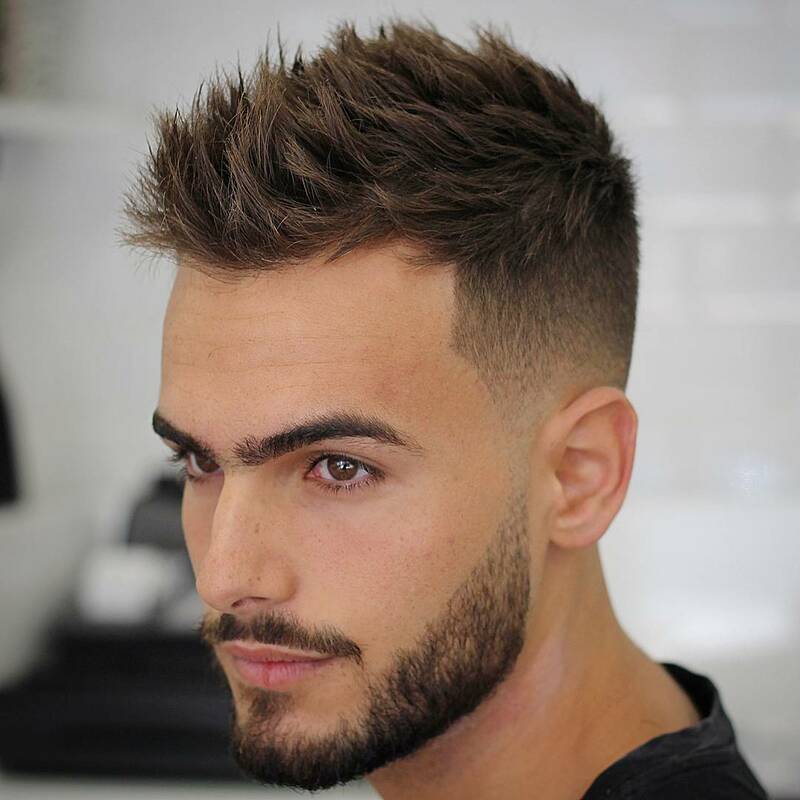 Okay, lets kick thinks off with some very cool short haircuts for men and short hair hairstyles. 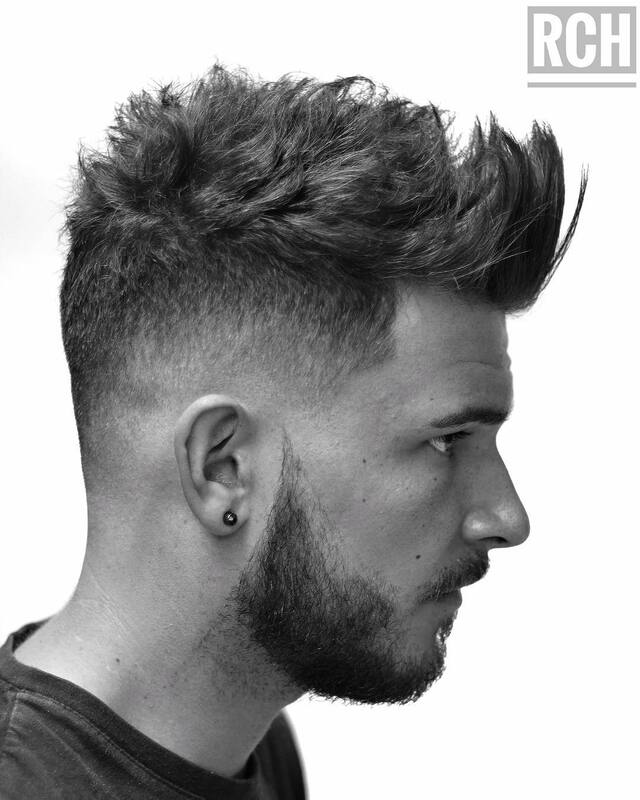 Perhaps the most popular haircut right now for men. 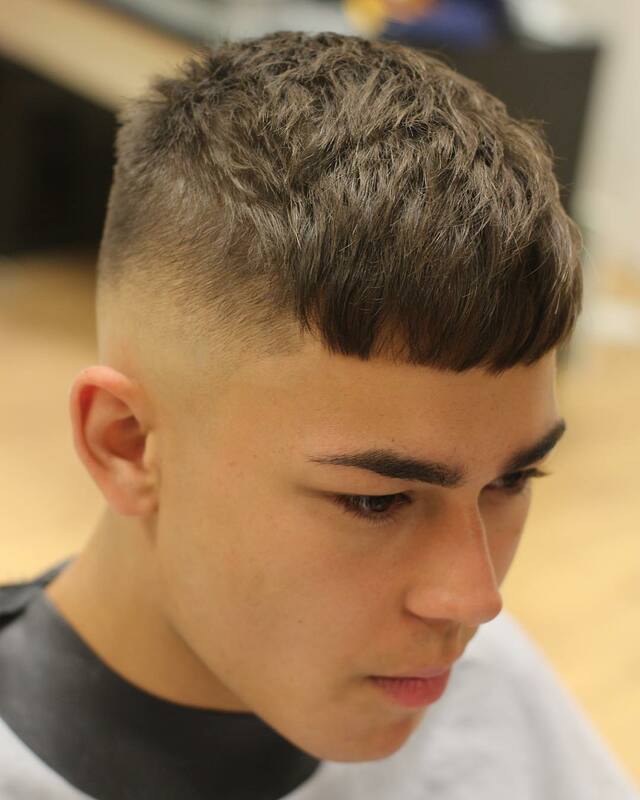 This cropped haircut features a bald fade and is styled in a very natural way. To get this look quickly blow dry or even towel dry. As you can see this haircut also works well for fine hair. 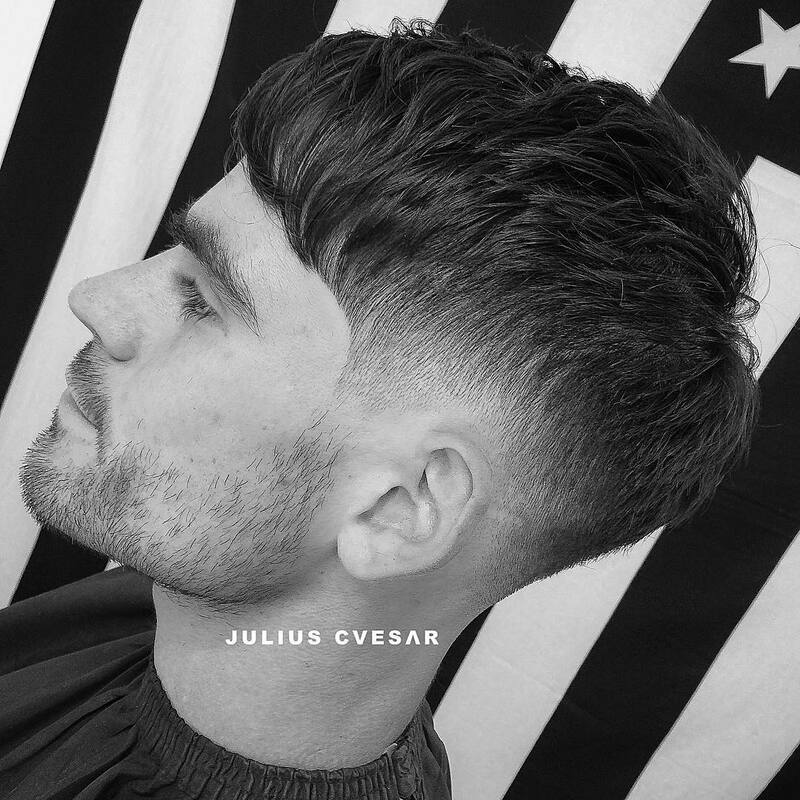 A great men’s haircut for all hair types. Textured on top. Bald fade and disconnected beard. 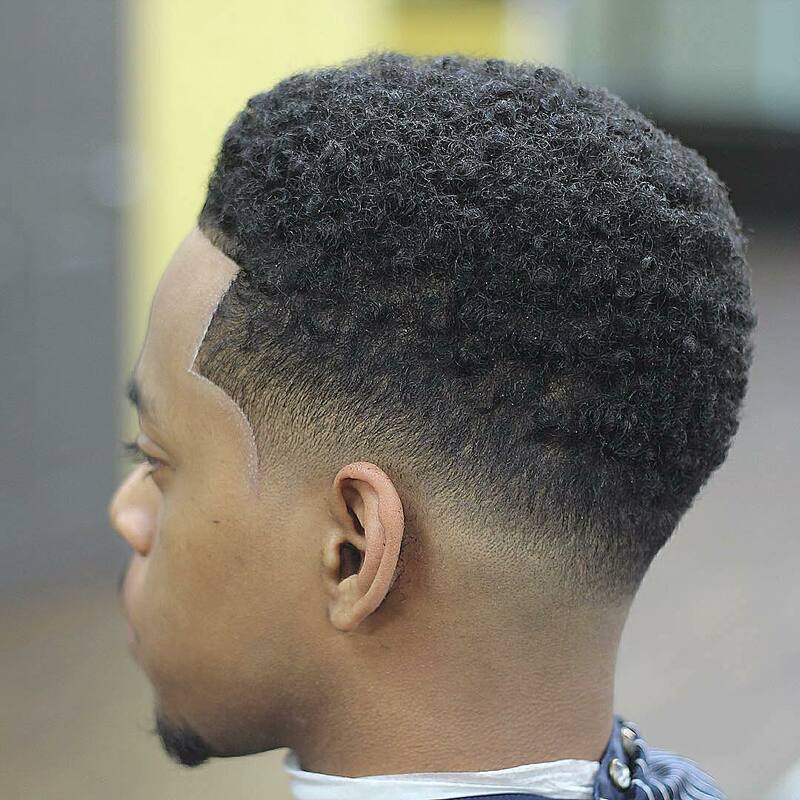 A nice fresh taper fade for men who have curly hair and want to keep it short and clean looking. This is the best blowout hairstyle I have ever seen. Awesome short textures on top. 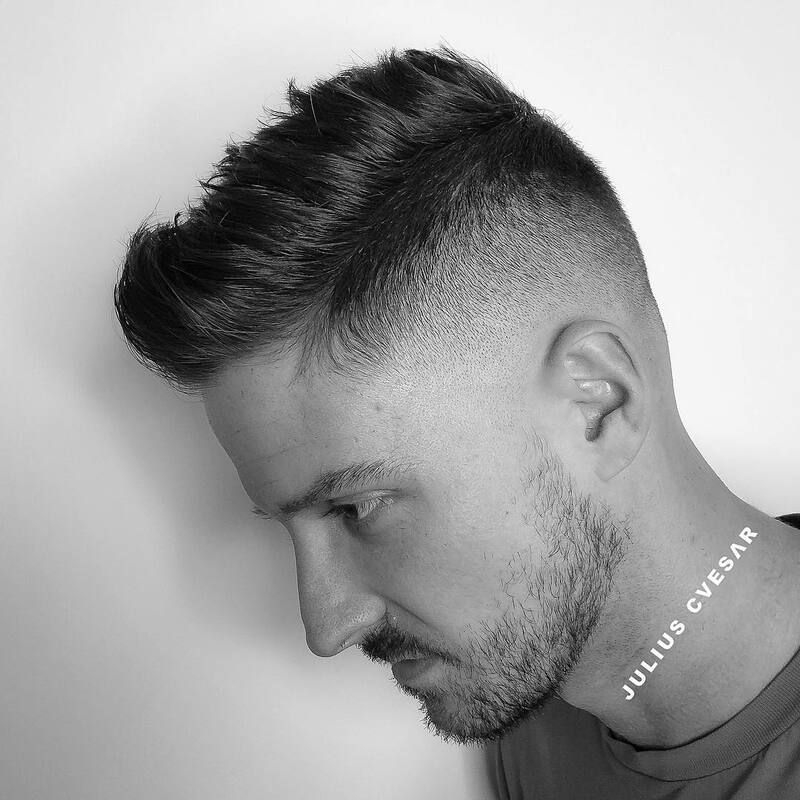 A totally sick short haircut for men featuring a drop fade and some heavy textures. 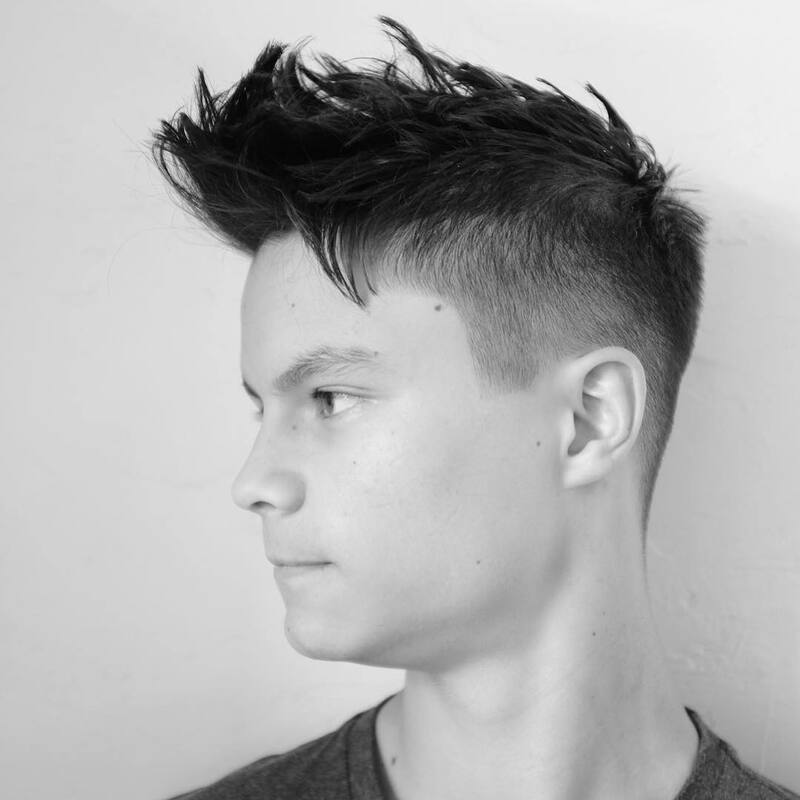 A very cool short haircut with textures to give that spiky look. 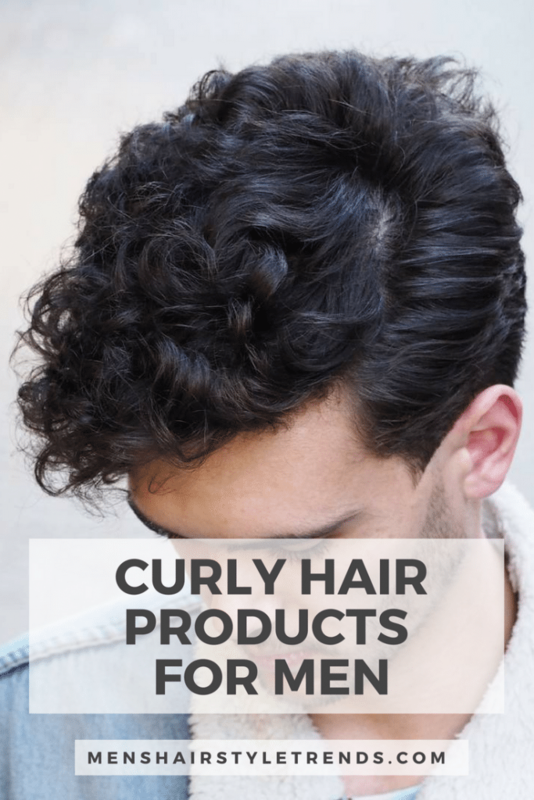 Want to tame your curly hair? Get it cut super short. 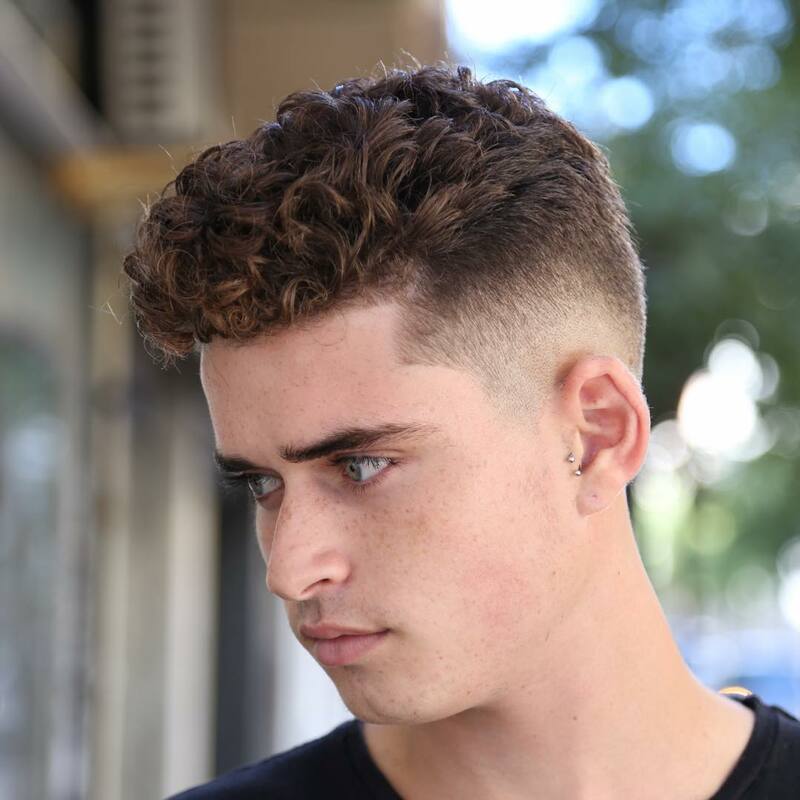 This is a great looking curly hairstyle for men that has been trimmed down super short except for a bit of length in the fringe. Features a high fade. 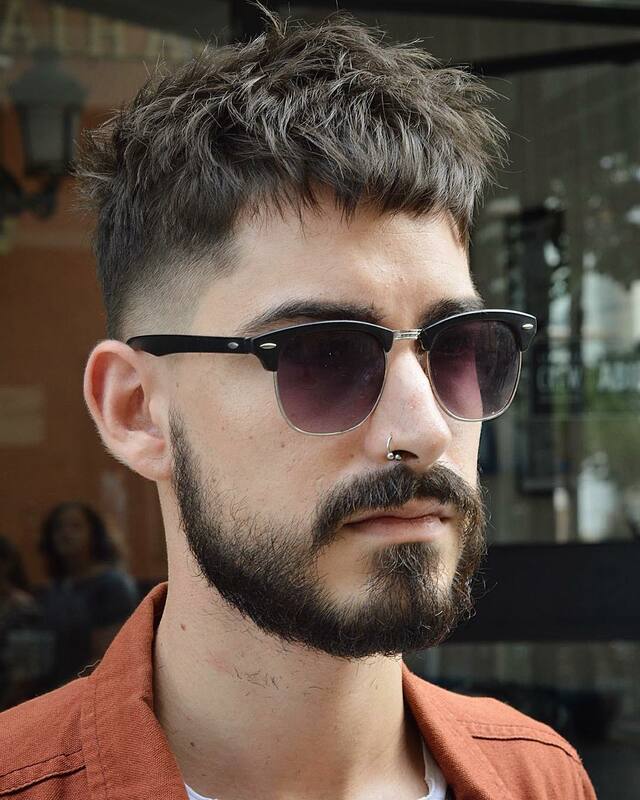 A short textured haircut that has been styled in a messy look. 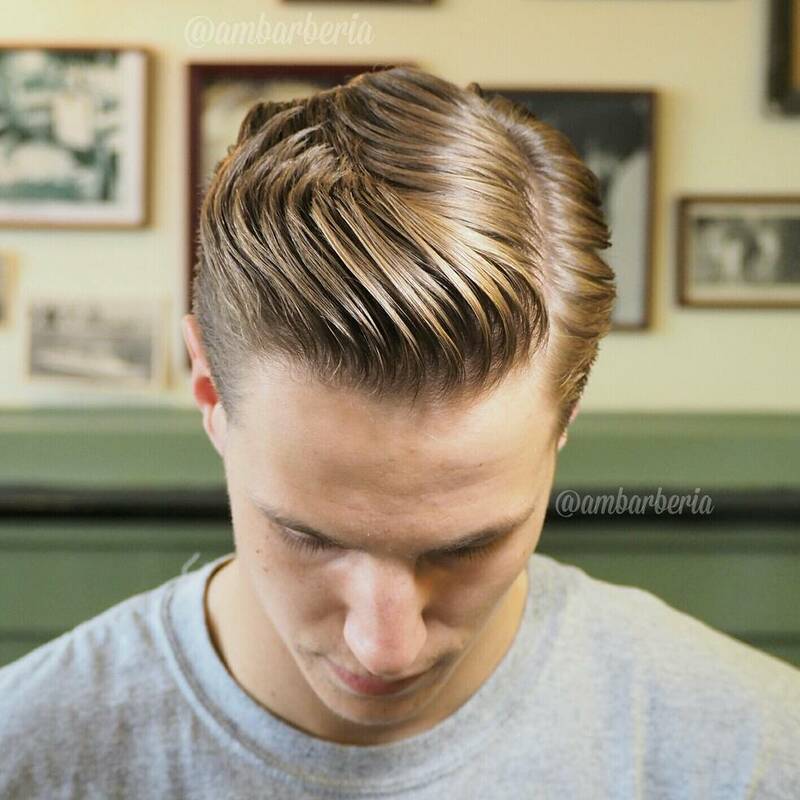 Work a small amount of medium hold pomade into your hair and let the textures work magic. 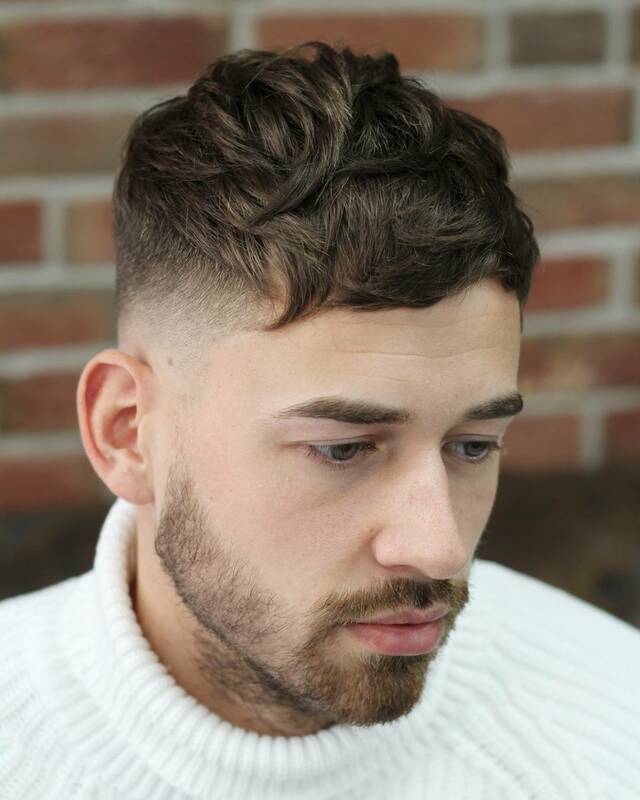 A short haircut for men that has been heavily textured to give that messy appearance. 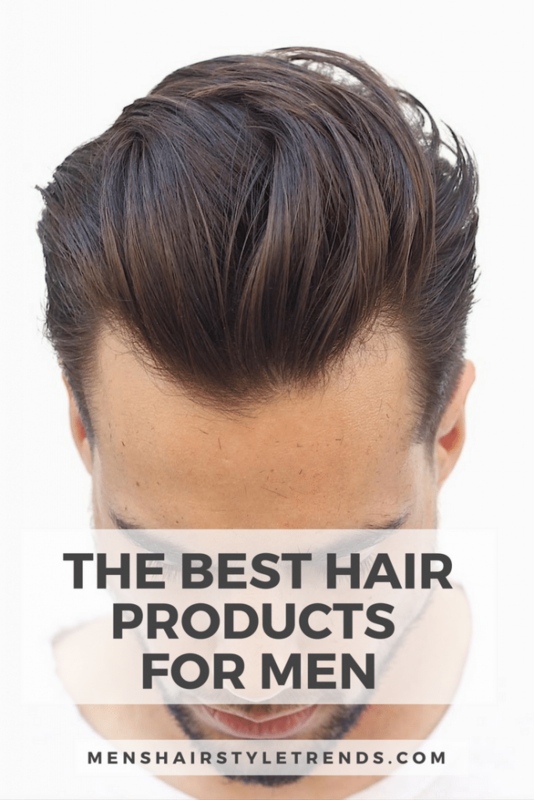 Work a small amount of hair product into your hair. If you have fine hair use a light to medium hold pomade. If you have thick hair use a stronger hold pomade. 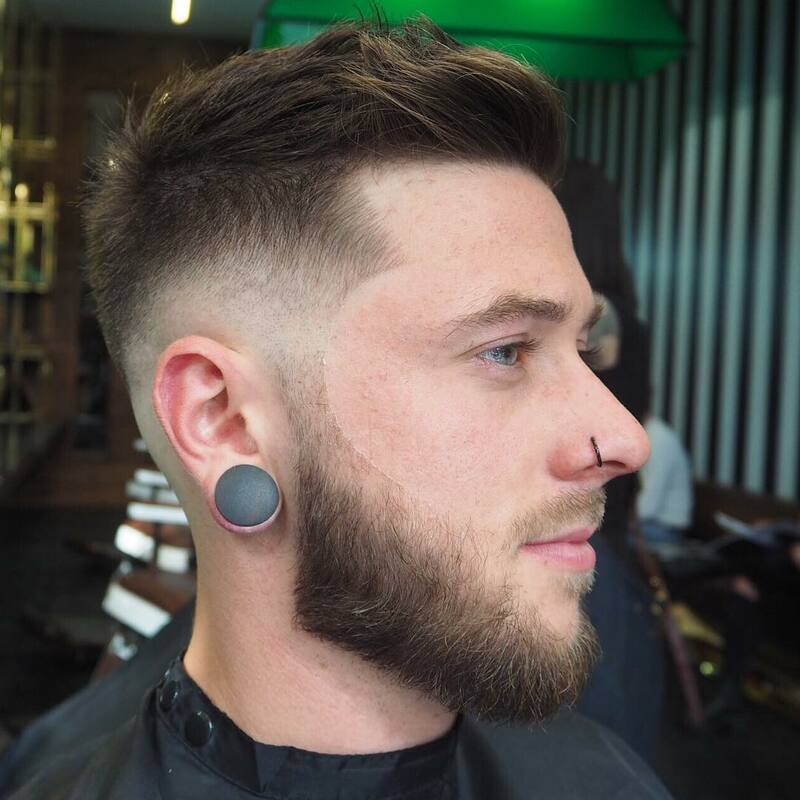 A super slick and very short crop haircut with a mid fade. 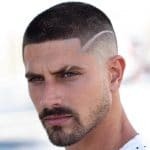 This is a cool men’s hairstyle. The short textured hair creates a neat but messy look. Totally sick disconnected beard. 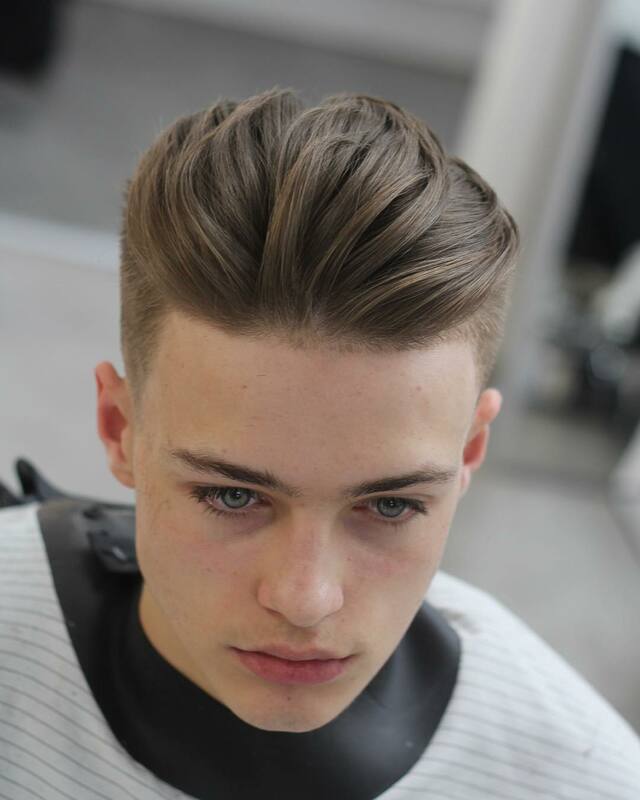 To get this look use a stronger hold pomade with a bit of shine, and work into damp almost dry hair. Use your fingers to create the messy spiky texture. This haircut works well with thick hair. Another beauty. 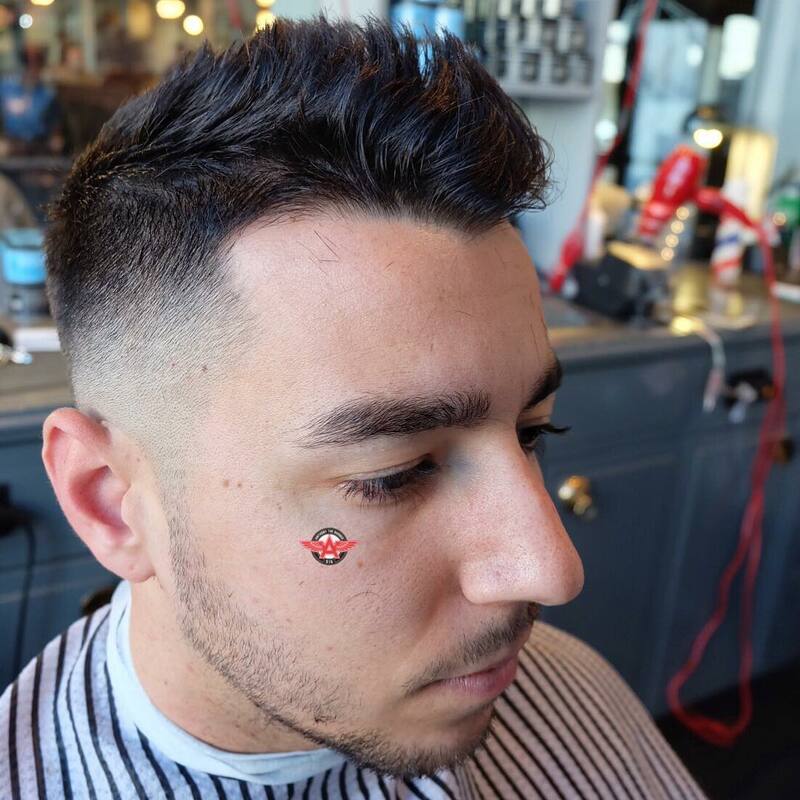 A super clean high skin fade. 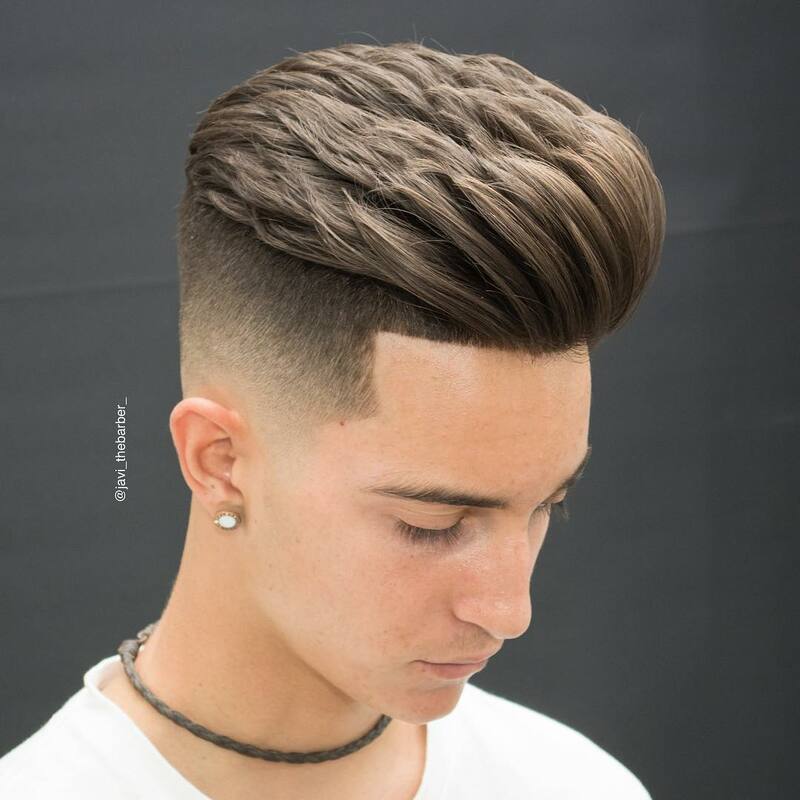 Textured hair on top is sculpted perfectly into a combover + quiff hairstyle. 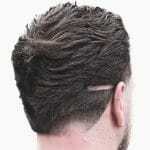 Features a high bald fade to complement the thick textured hair on top. 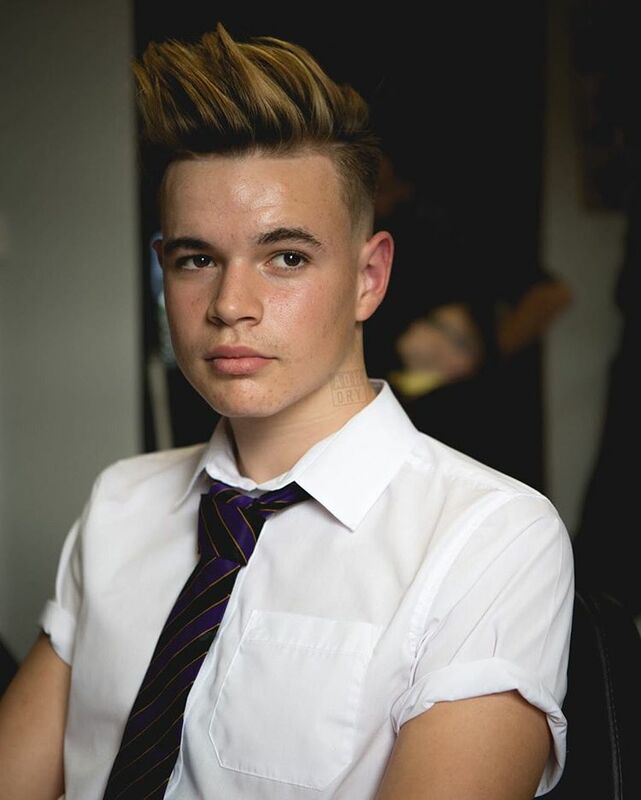 Fringe is styled into a pointy quiff. 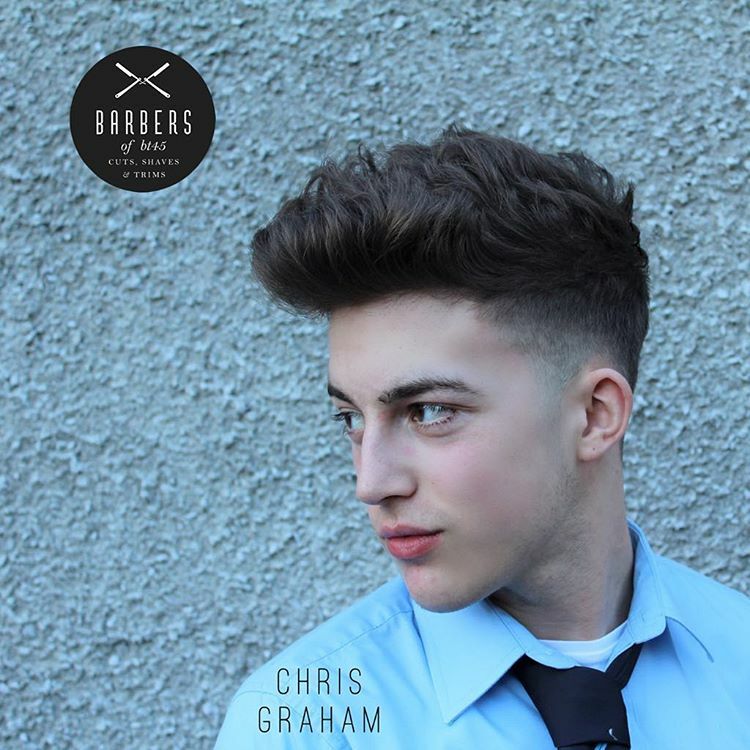 If you have thick curly hair this is a great haircut to get. 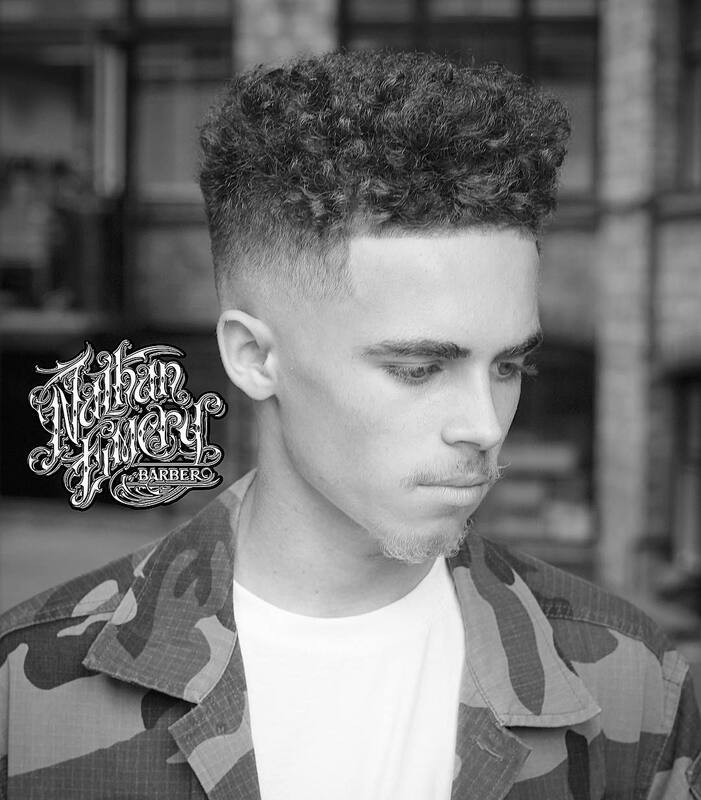 It features a drop skin fade and the curly hair on top is trimmed down nice and short. A touch of weight is kept in the front. 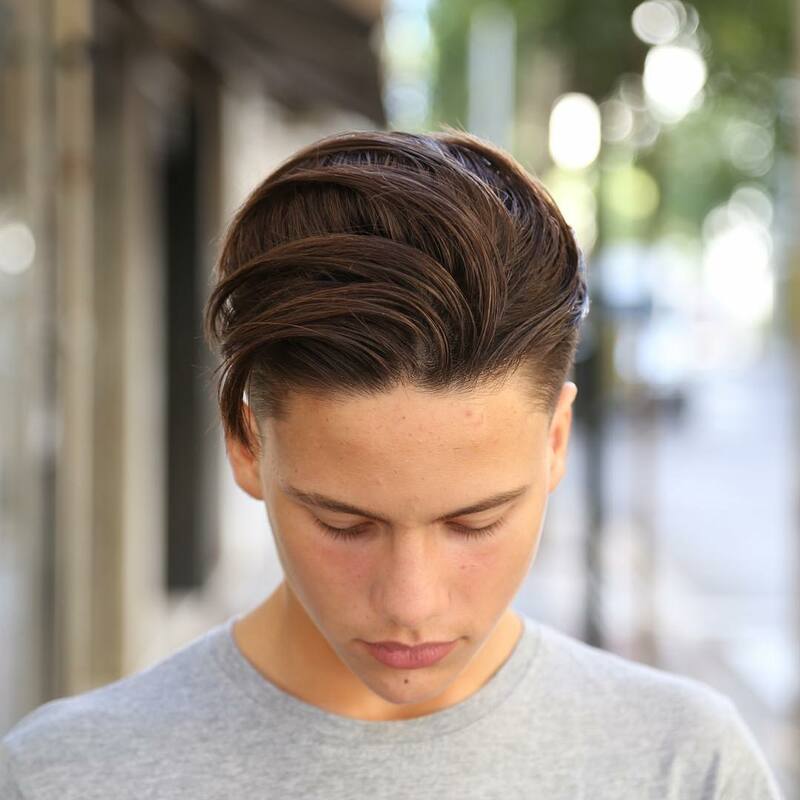 This is a great looking hairstyle for men with straight hair. It features a high fade and some length in the fringe or bangs. To get this look blow dry your hair back using a hair brush. 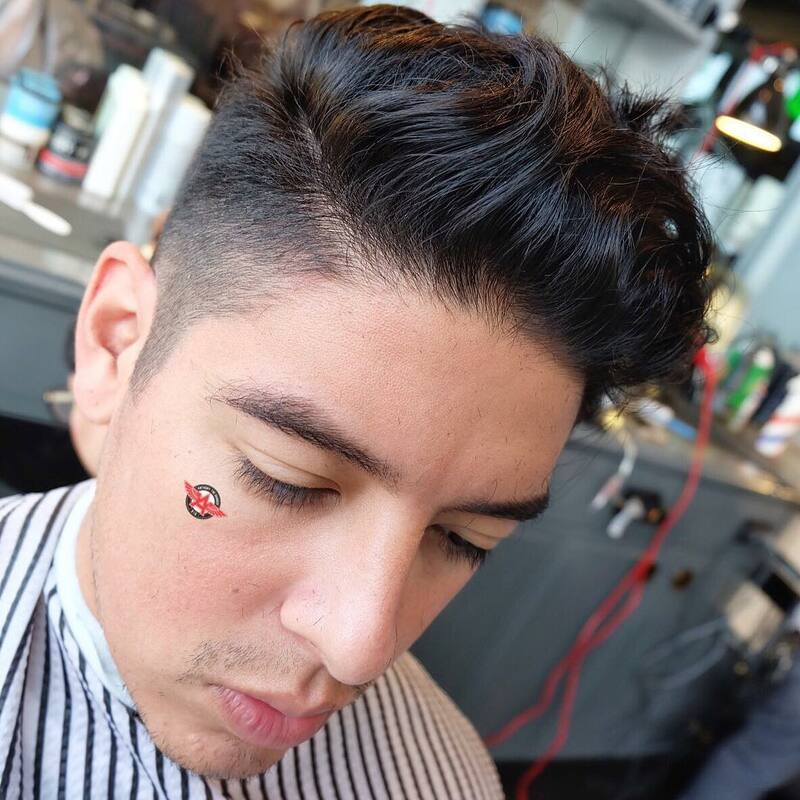 Use a light hold matte finish pomade. 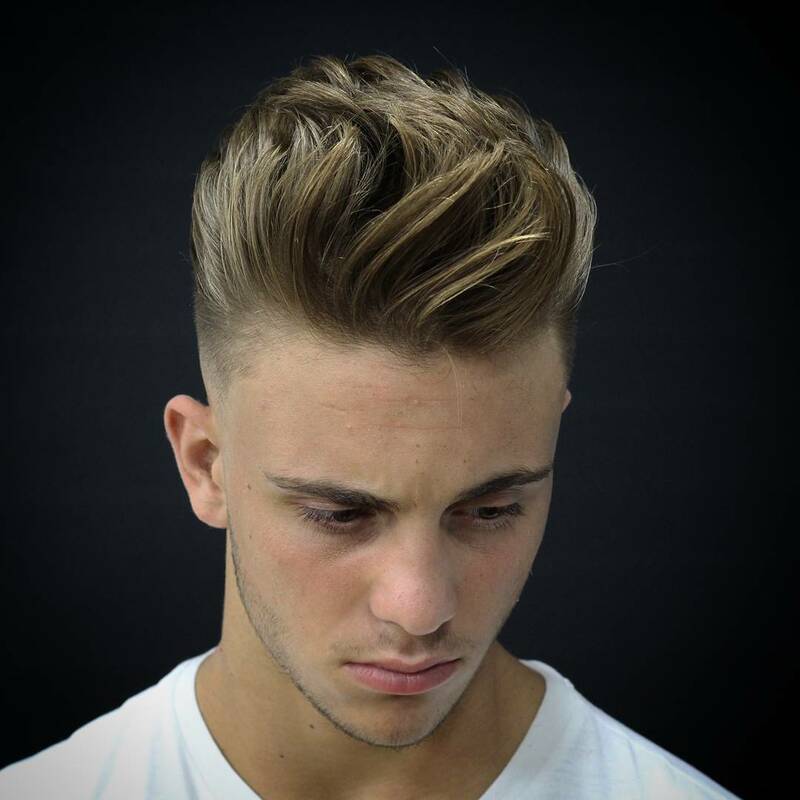 An amazing choppy spiky hairstyle. 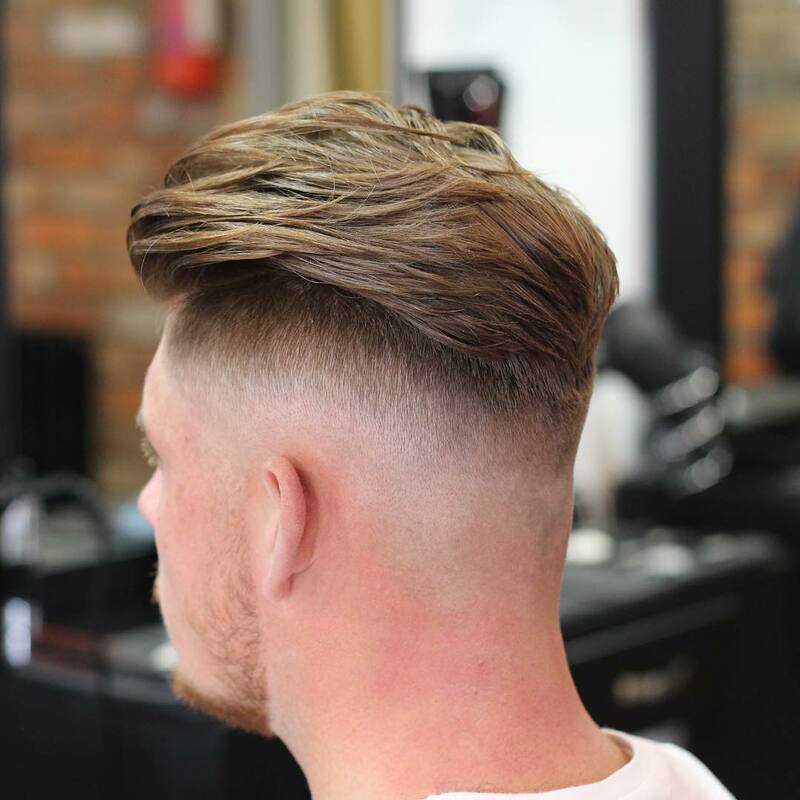 This haircut has transformed what is actually rather fine hair and has made it look thick and full of volume with some awesome movement. 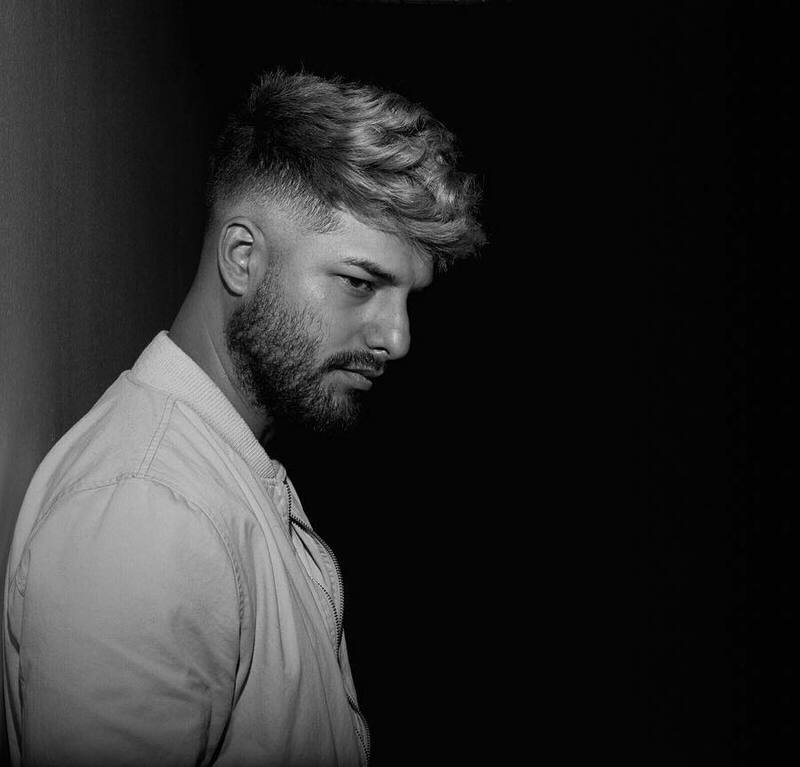 Features a high fade but not much skin or too short. Very cool. Total perfection. 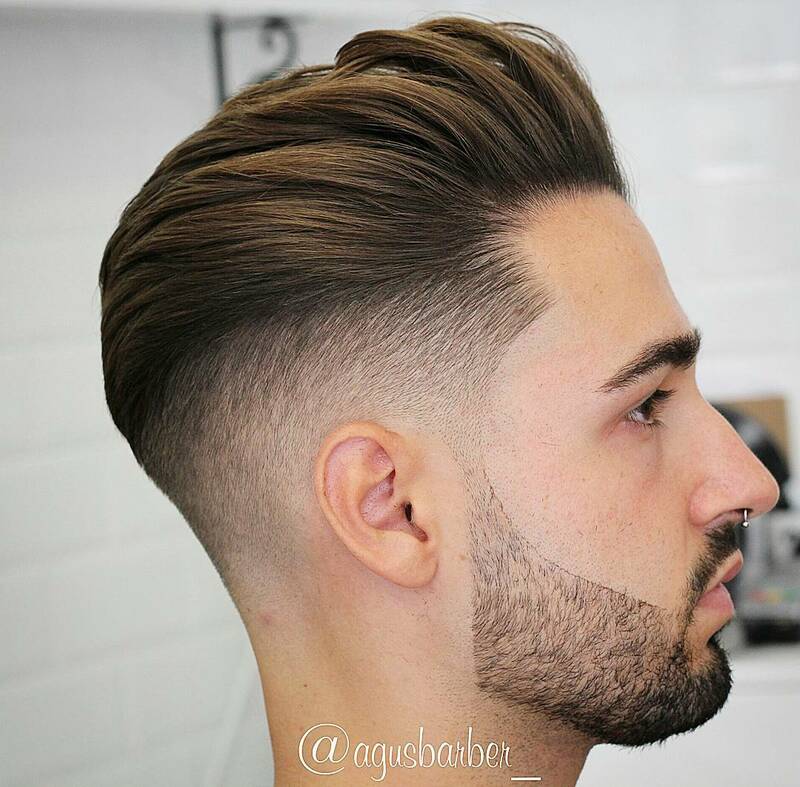 The lines on this haircut and the shaping on top are amazing. 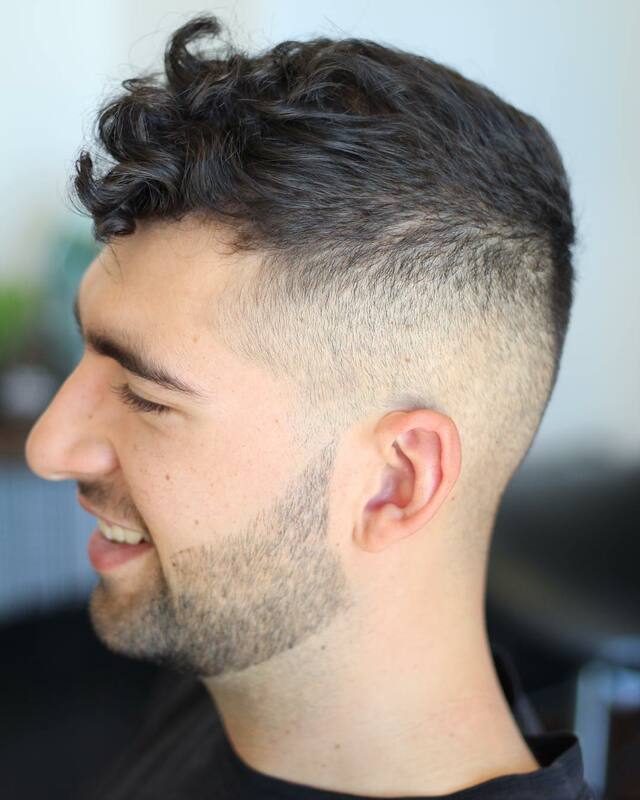 We have a bald drop fade that complements and shows off the nicely trimmed curls. Super slick. 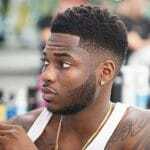 A nice temple fade short haircut for men that have thick hair. Disconnected and well groomed beard looks great. 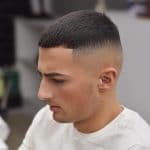 This is a good short men’s haircut if you have a receding hairline. The skin fade is taken very high up the temple which brings the focus clear on the top. 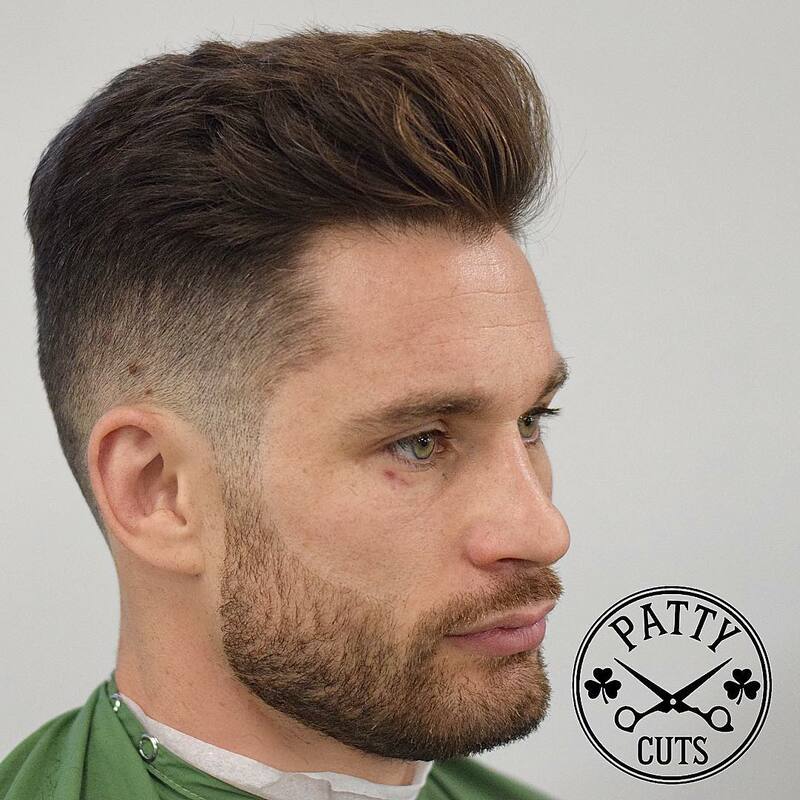 Another amazing classic men’s haircut by Pat with a super clean fade and beard. 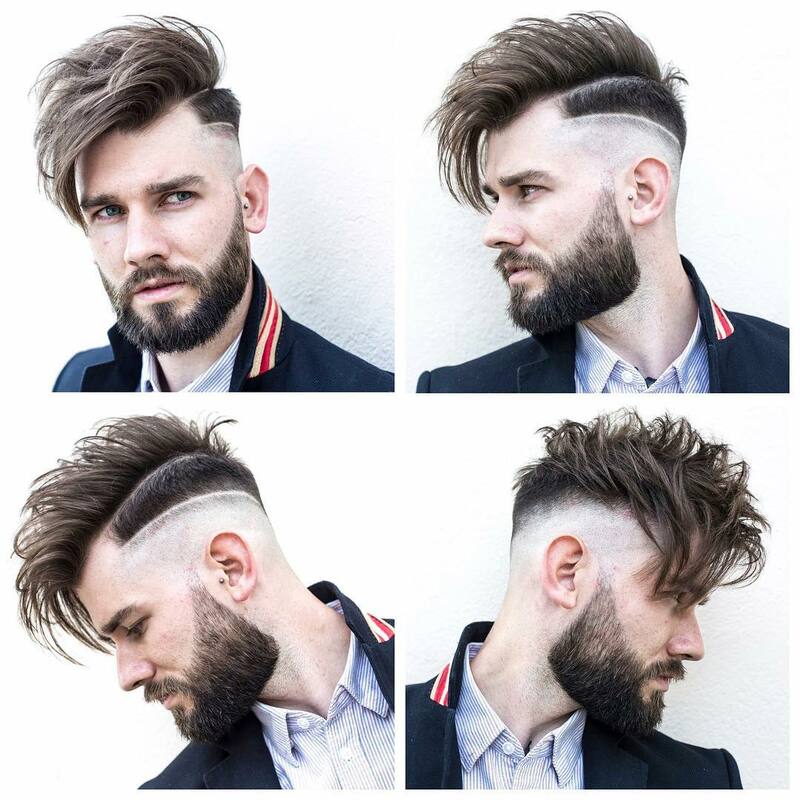 This haircut will work with any hair type. To get this look use a hairdryer and brush your hair straight back while drying. 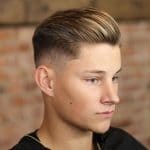 This is a natural flow men’s hairstyle that you will see more and more in 2017. Short on the sides but too short. Lots of scissor work. 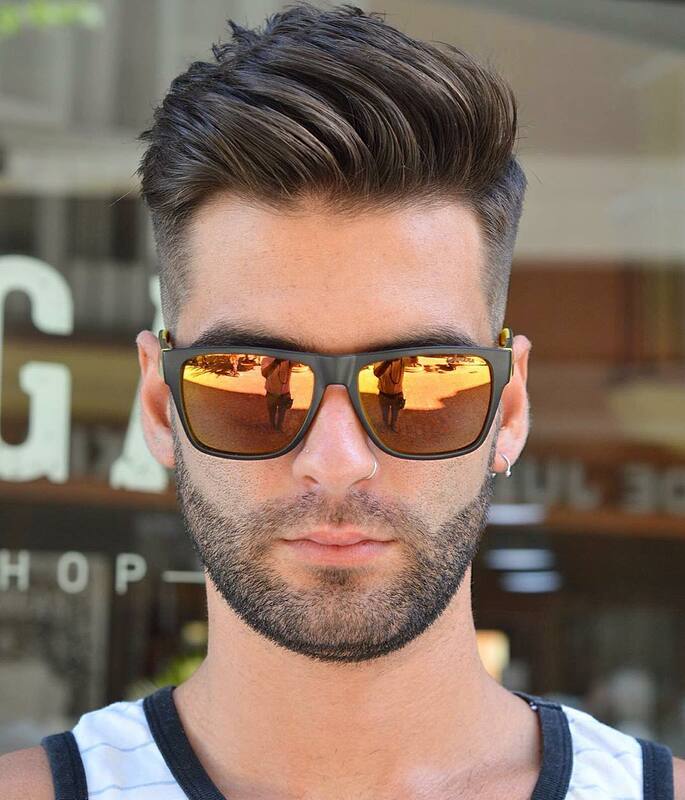 A great haircut for men that have thick hair. 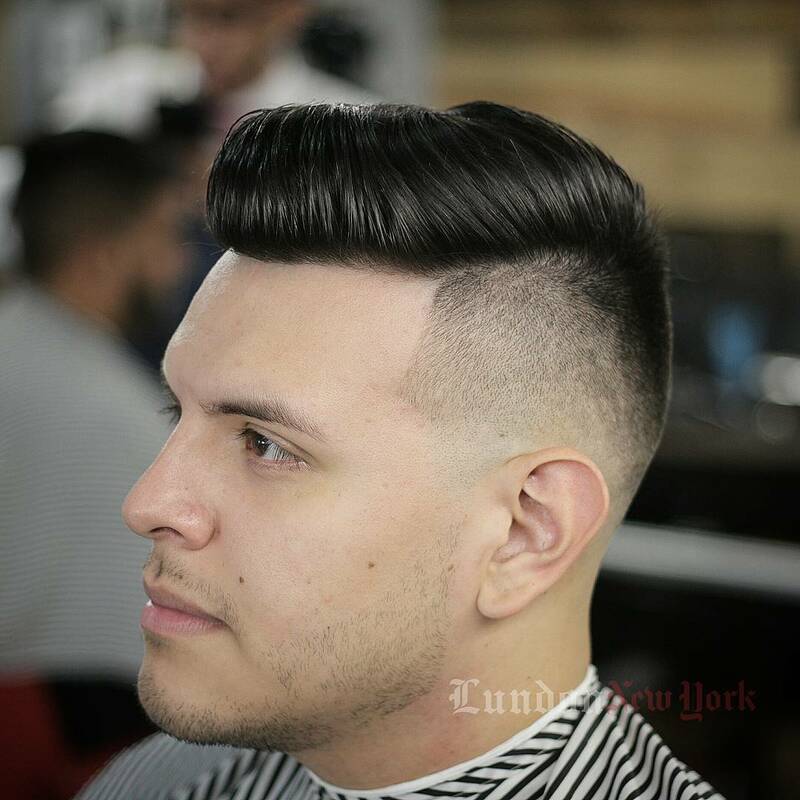 Use a blow dryer and brush then use a small amount of pomade to get that side part right. 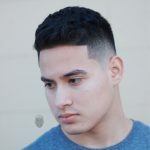 This is a short men’s hairstyle that we have seen quite a bit this year where the fade is taken very high up the hairline and into the peak. Kind of like a partial buzz cut. 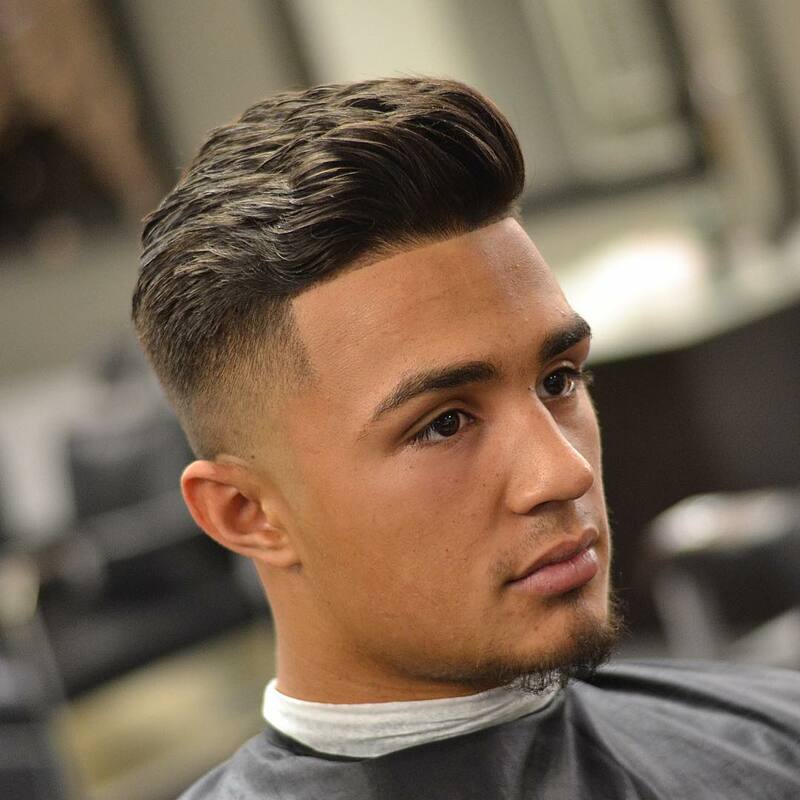 Great looking drop fade blended perfectly into a short length of hair. 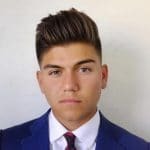 Very cool short men’s hairstyle. It looks like a blend of a few different short hairstyles in one. 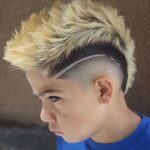 Totally amazing haircut…not just a simple crop, but a spiky crop haircut. Cool contrast between the sides and the thick hair on top. 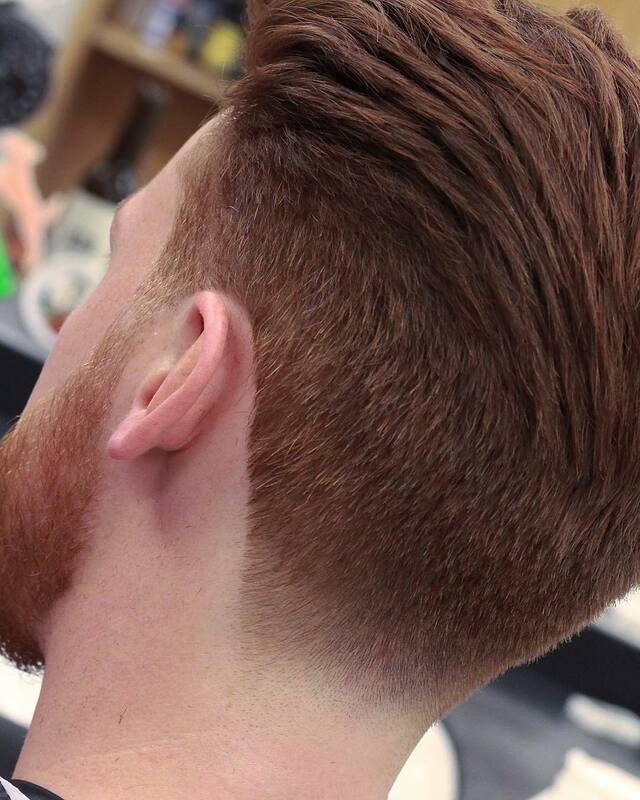 A classic men’s haircut that always looks great. Short simple and clean. 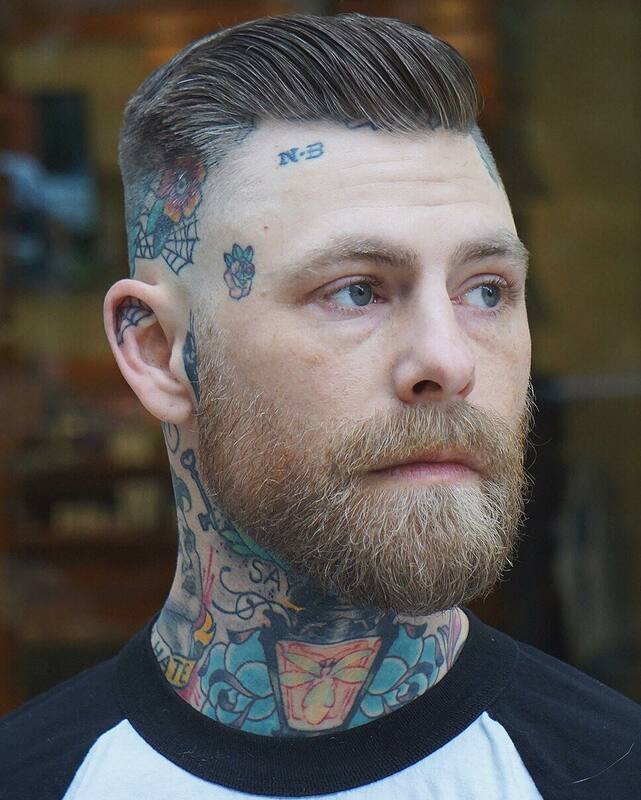 This haircut features a high bald fade on the sides to show off the tattoo and a short length on top that is slicked back. Short textured hair on top is styled into a neat but messy look. 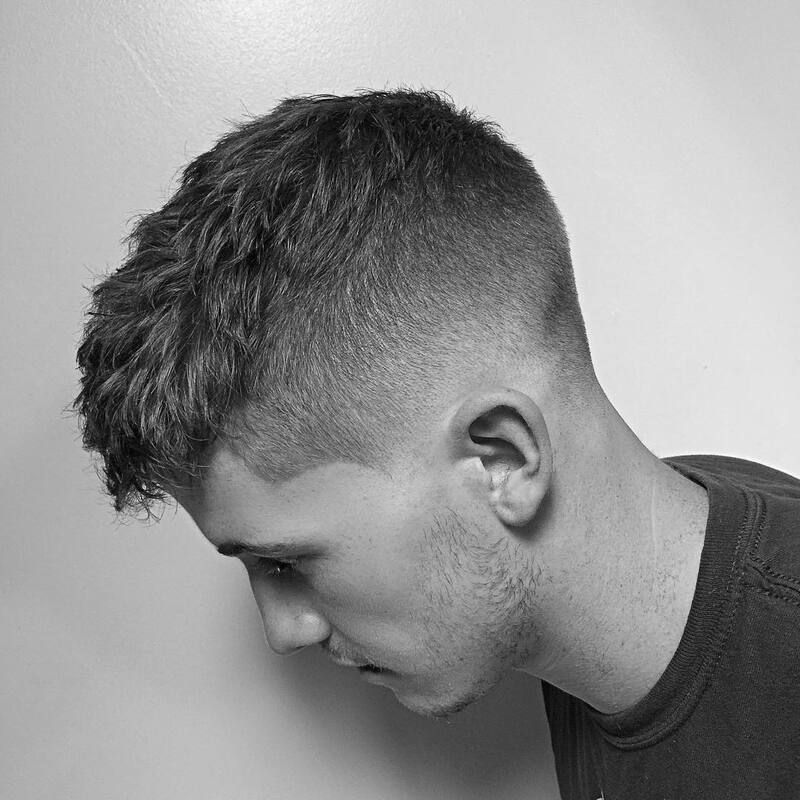 A super clean fade haircut with natural textures on top styled from back to front. 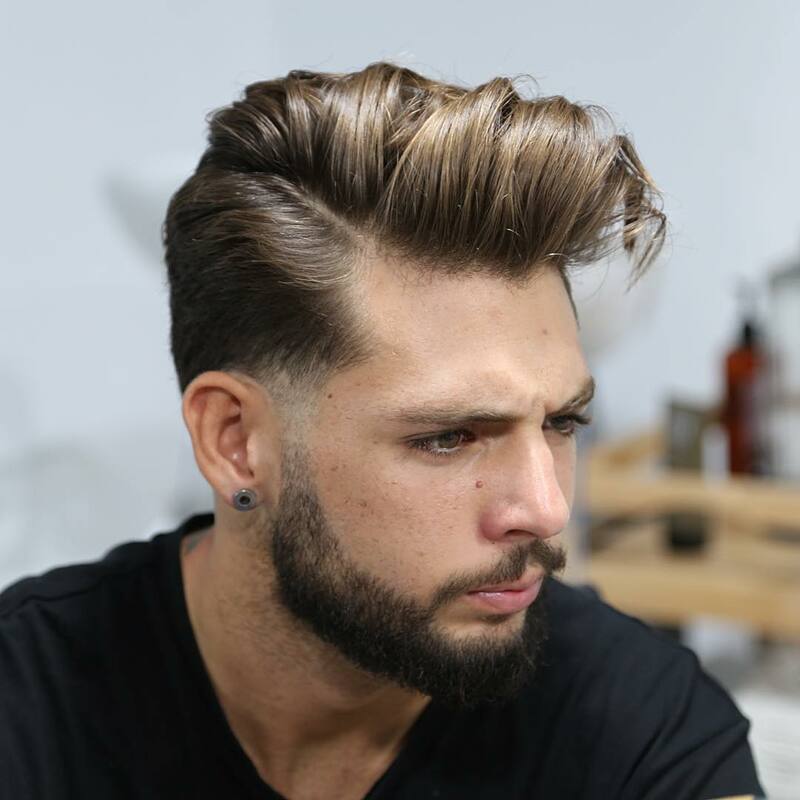 A cool looking quiff hairstyle for men that have thicker hair. 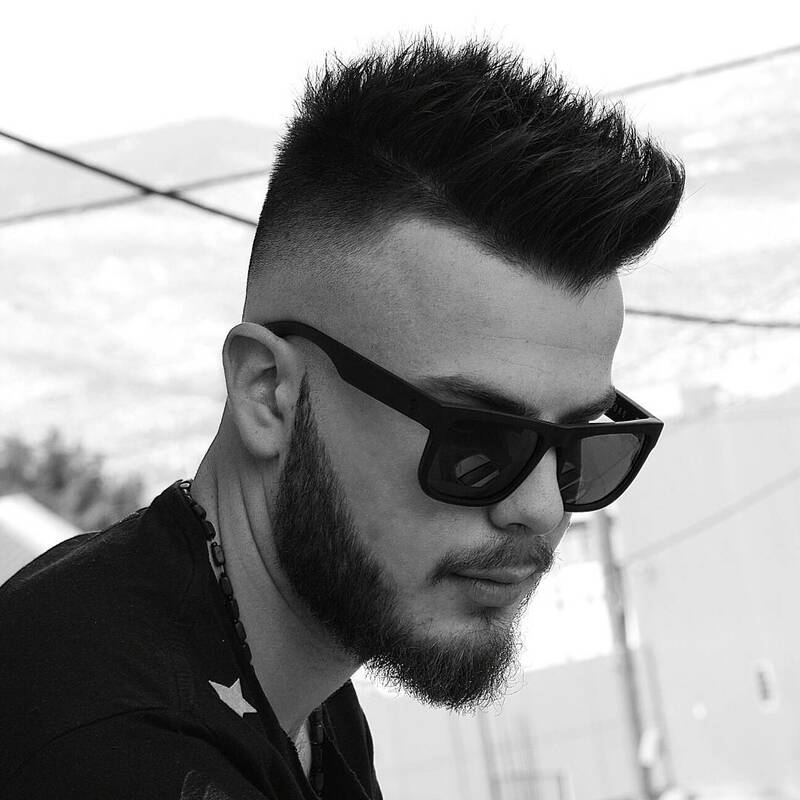 Features a bald fade, hard part and choppy textures on top. Short to medium length curls on top kept very natural. 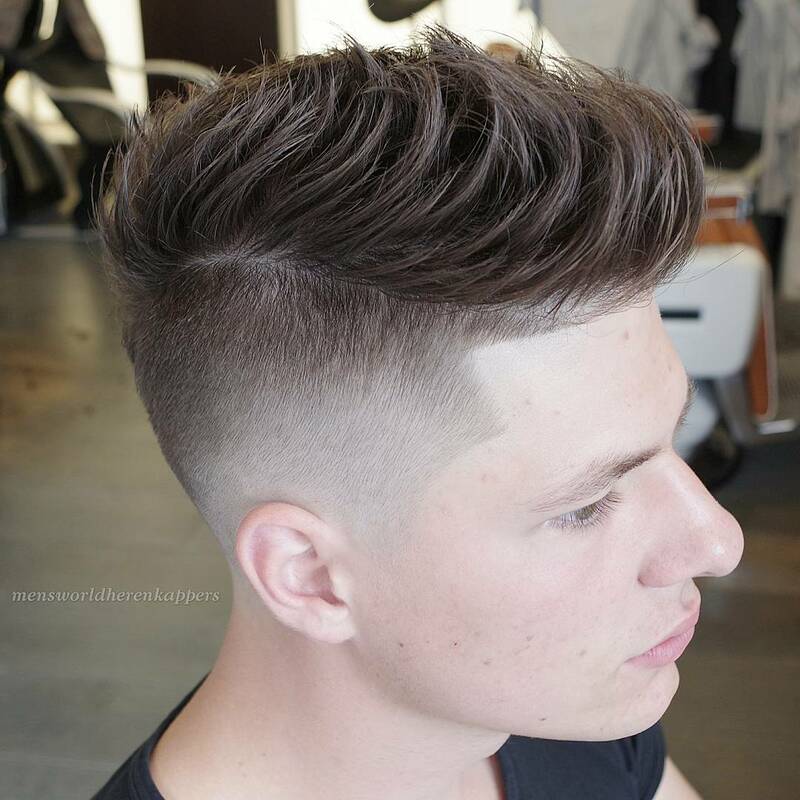 A cool men’s haircut that features a bald fade with medium hair length on top. 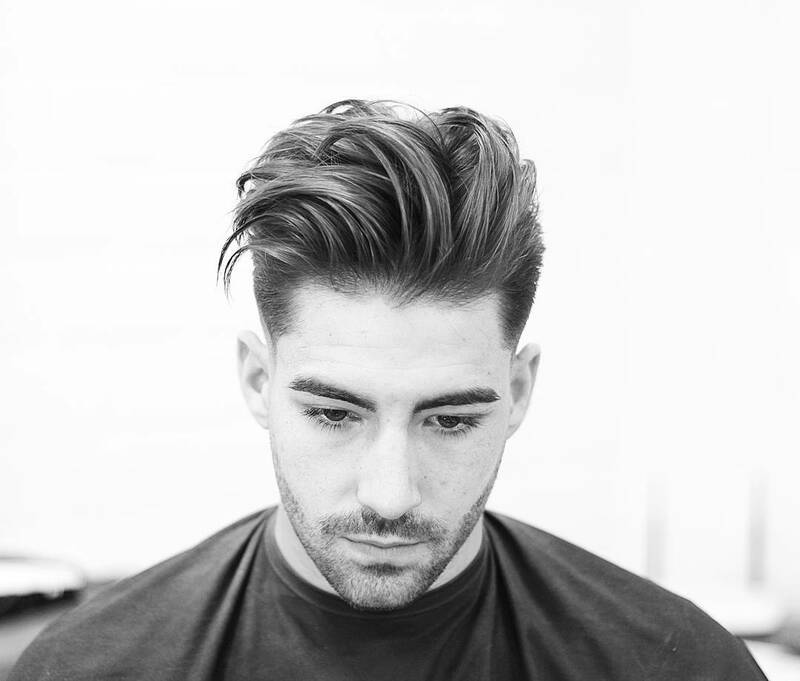 Blow dry the hair to give it some volume and then slick it back with a medium hold matte finish pomade. This is how you cut thick hair. 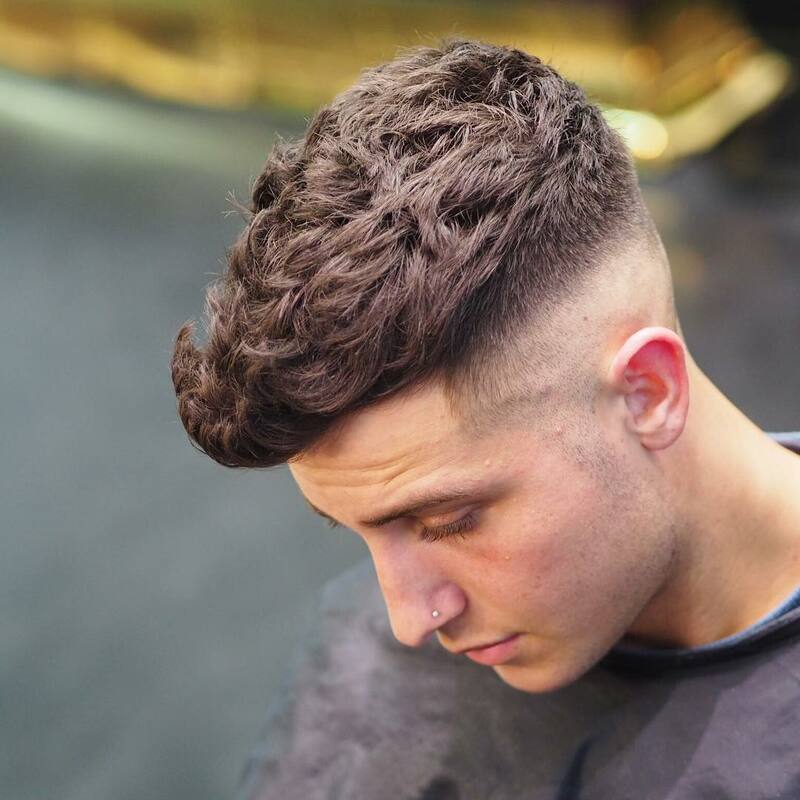 A high skin fade with beautifully sculpted thicker hair on top. 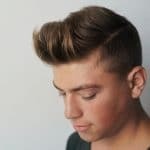 A super cool quiff hairstyle for guys that have thicker hair. 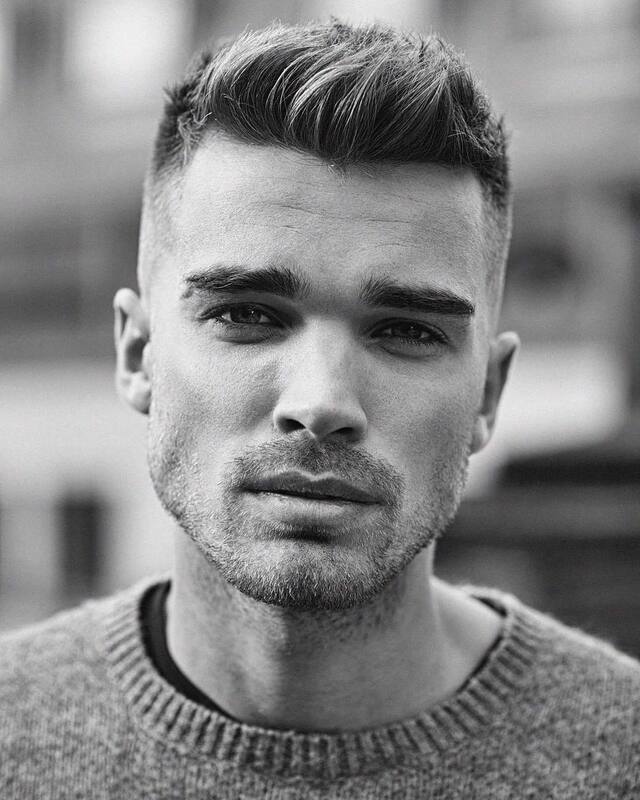 This haircut features a high skin fade and medium length textured hair. Awesome movement created by the textures and flow. 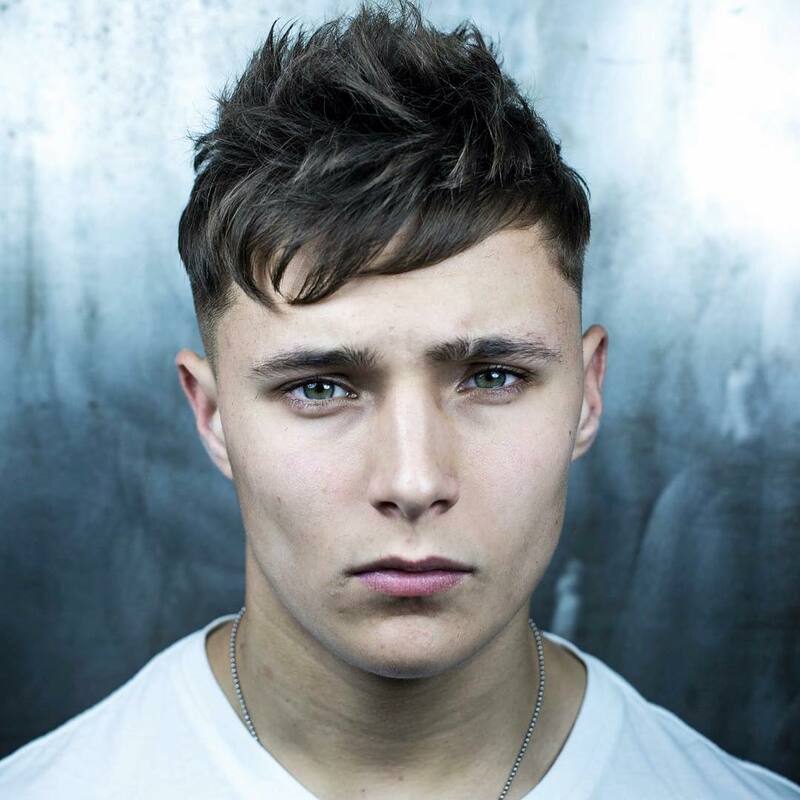 A good example of shorter hair on the sides that is scissor cut and kept a bit longer than with a fade. 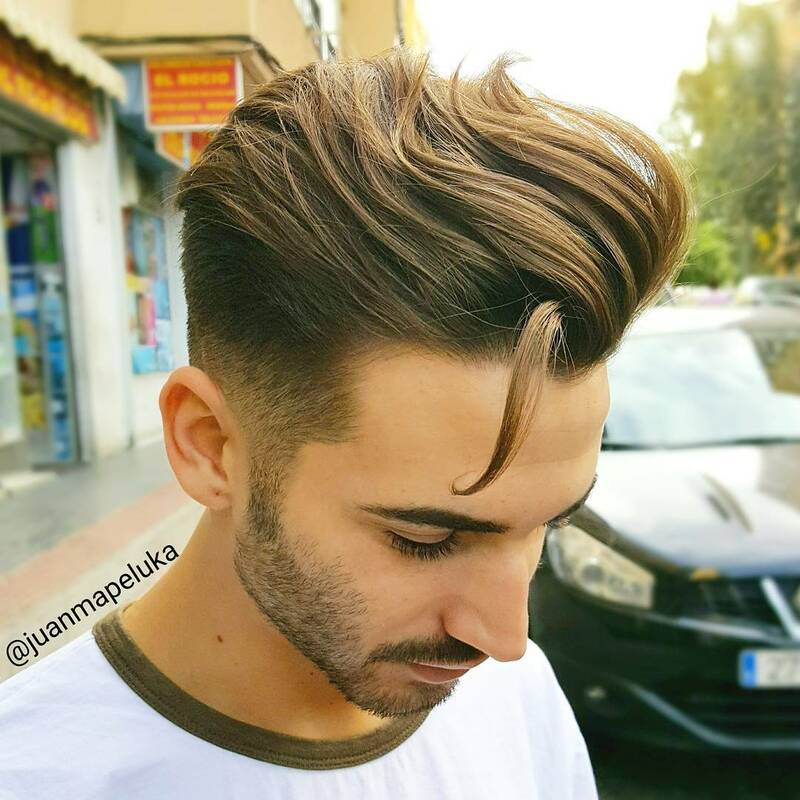 Cool side part combover hairstyle. 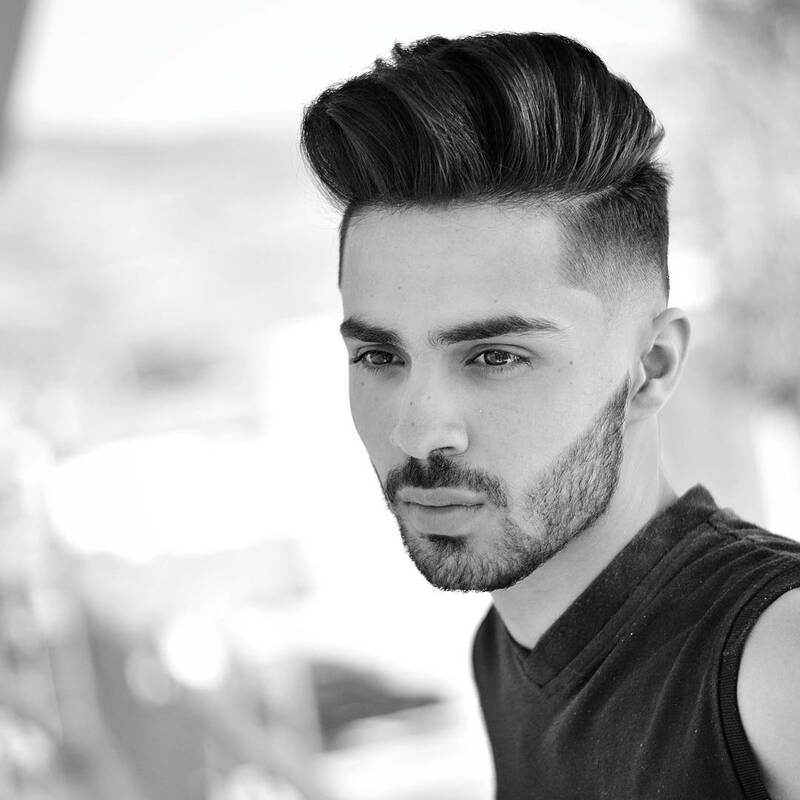 Cool slicked back pompadour hairstyles for guys that have a full head of hair. 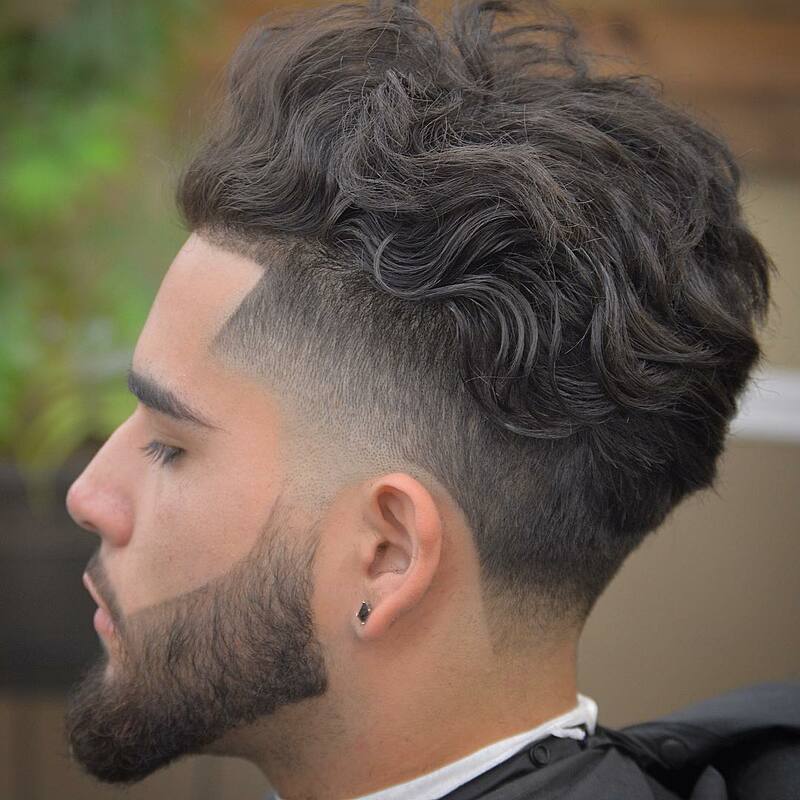 Killer look for guys that have curly hair. 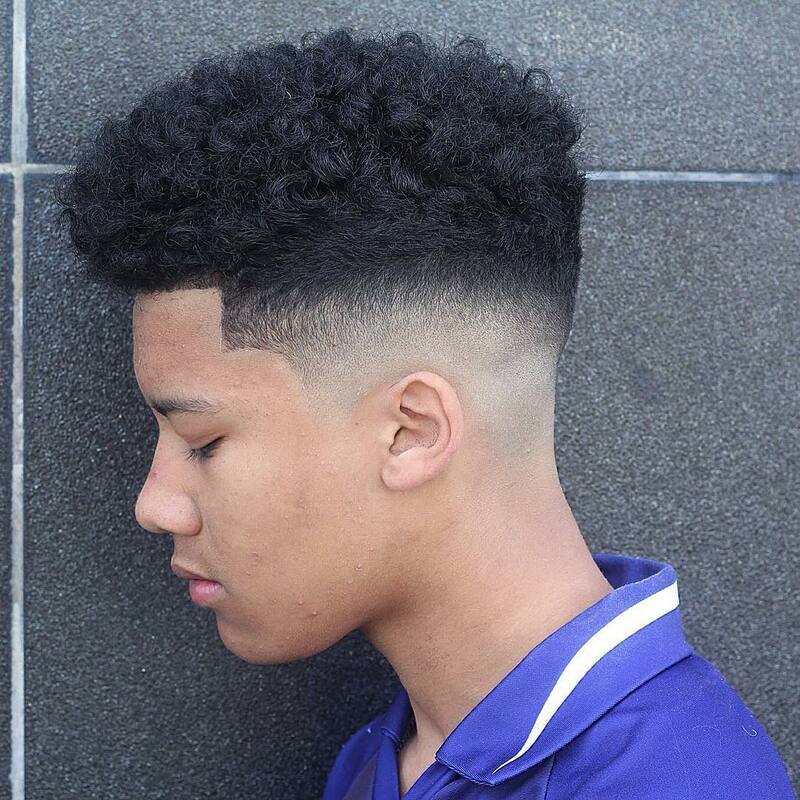 Super slick skin fade with long disconnected curls on top. 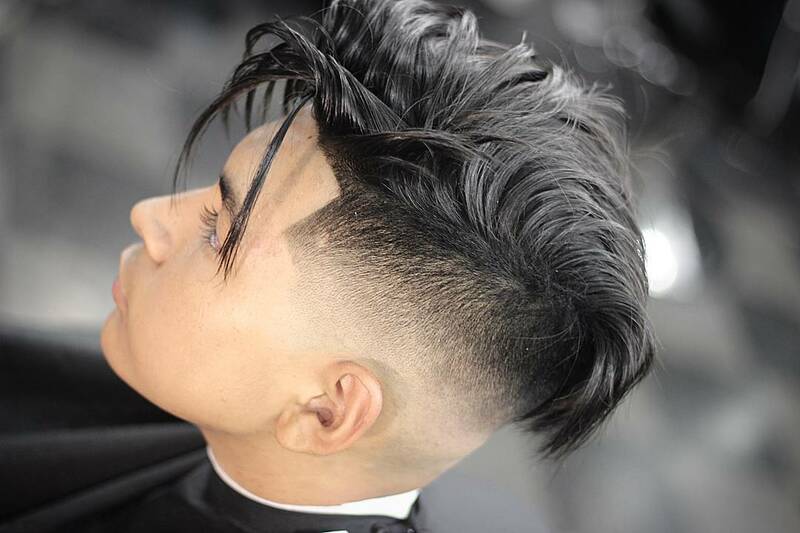 Sweet looking modern undercut hairstyle. Beautifully executed details. 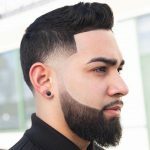 Super clean skin fade, disconnected beard. 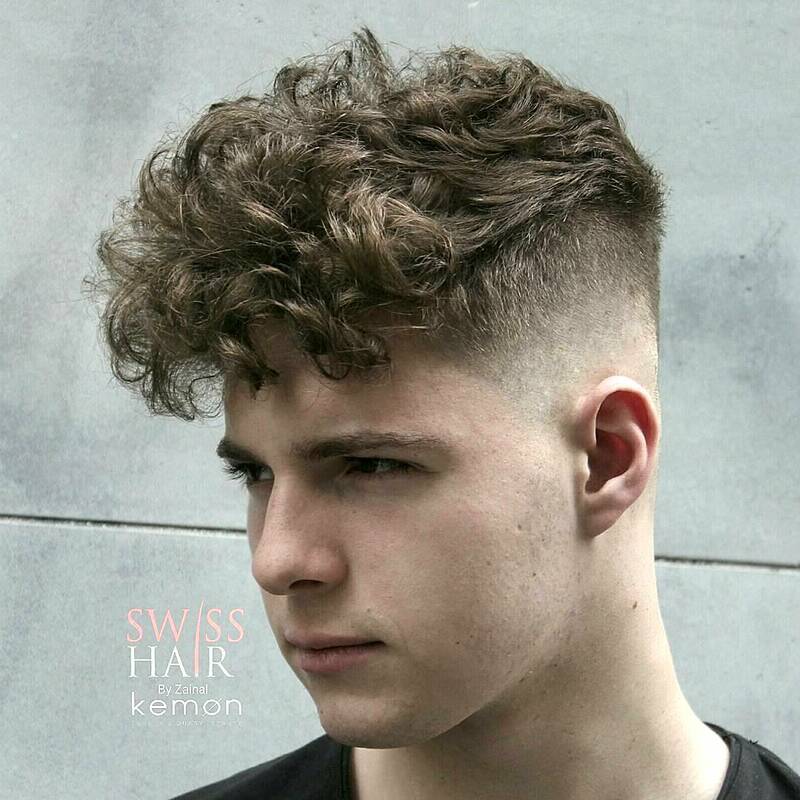 A very cool hairstyle for thick hair or curly hair. Textured on top, styled forward. 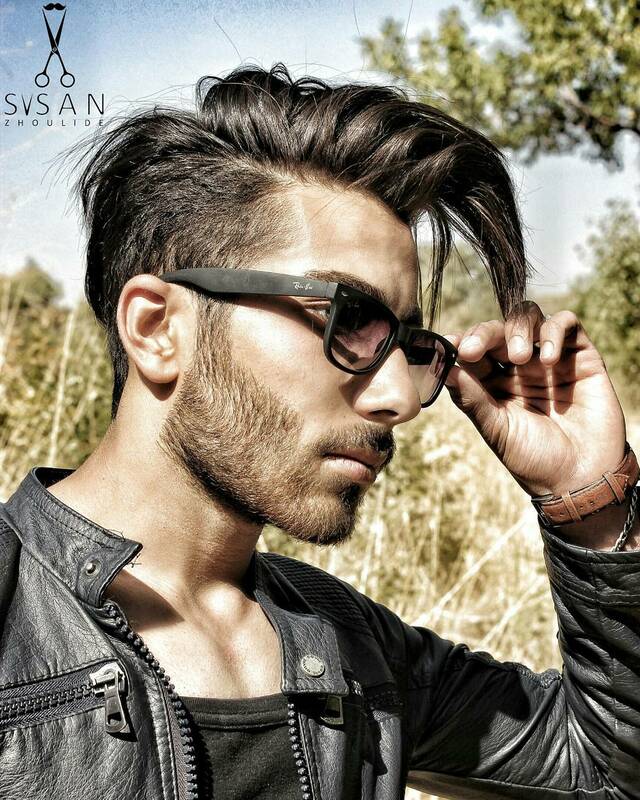 A wicked hairstyle for men that have thick hair. High fade. Medium textured hair on top with longer fringe (bangs) styled nice and tall. Short sides and medium hair on top brushed back into an all natural look. 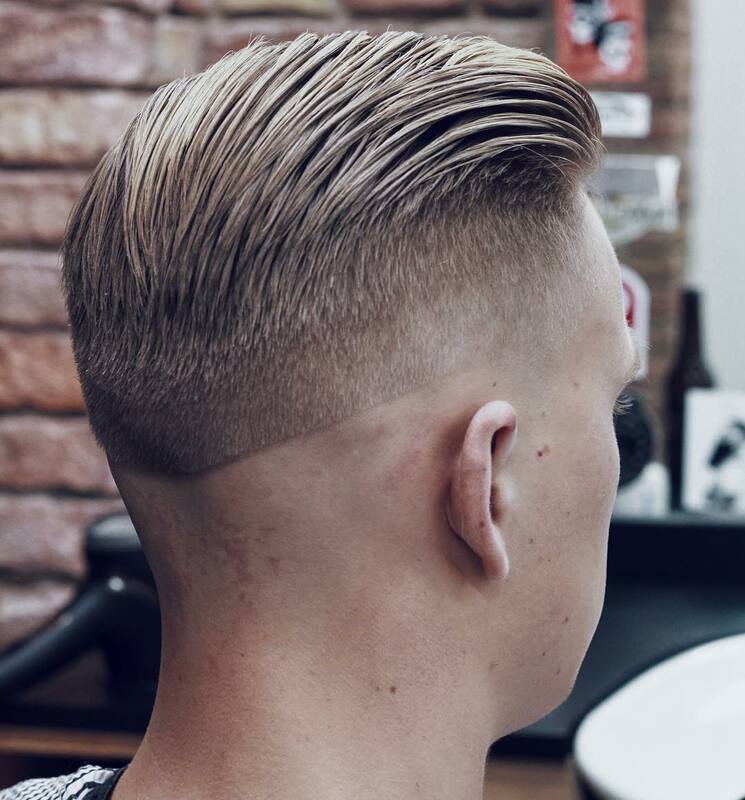 A cool drop fade with surgical part hair design on the side. Medium natural curls on top. I like to call this the “dry slick”. 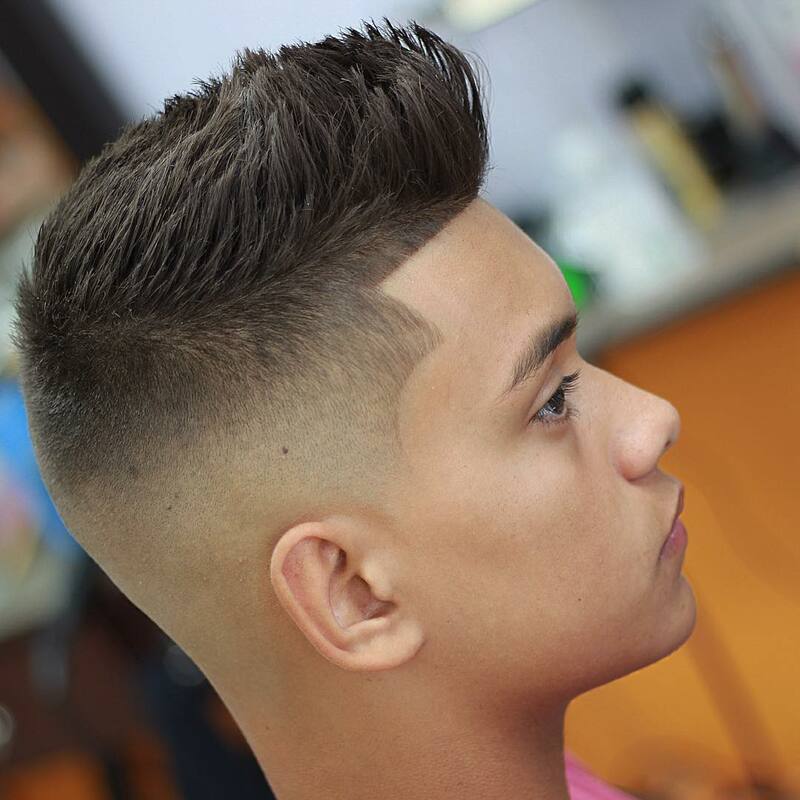 The haircut features a high fade with medium length on top and long fringe. First blow dry. Brush. Use hair spray to hold in place. 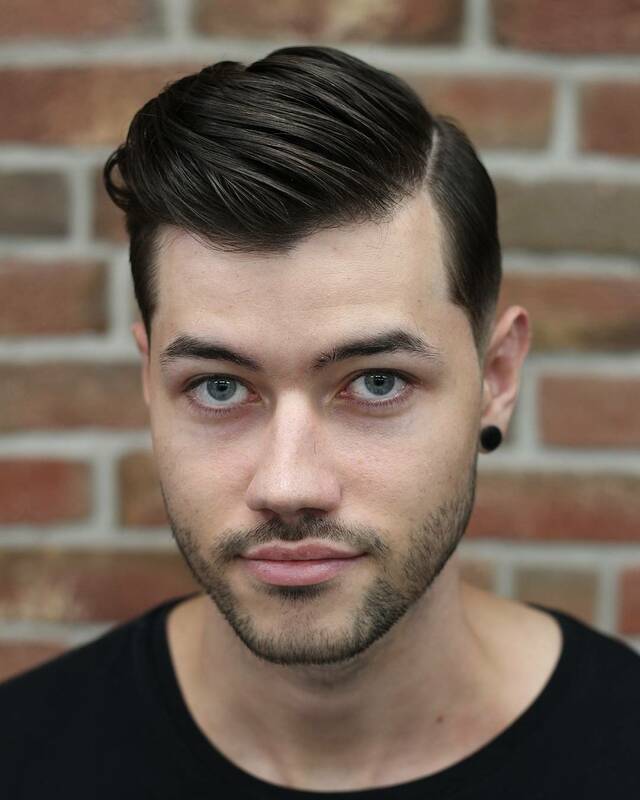 Tall messy hairstyle for men with medium to long textured hair. Great tall hairstyle if you have thick straight hair. Beautiful fade. 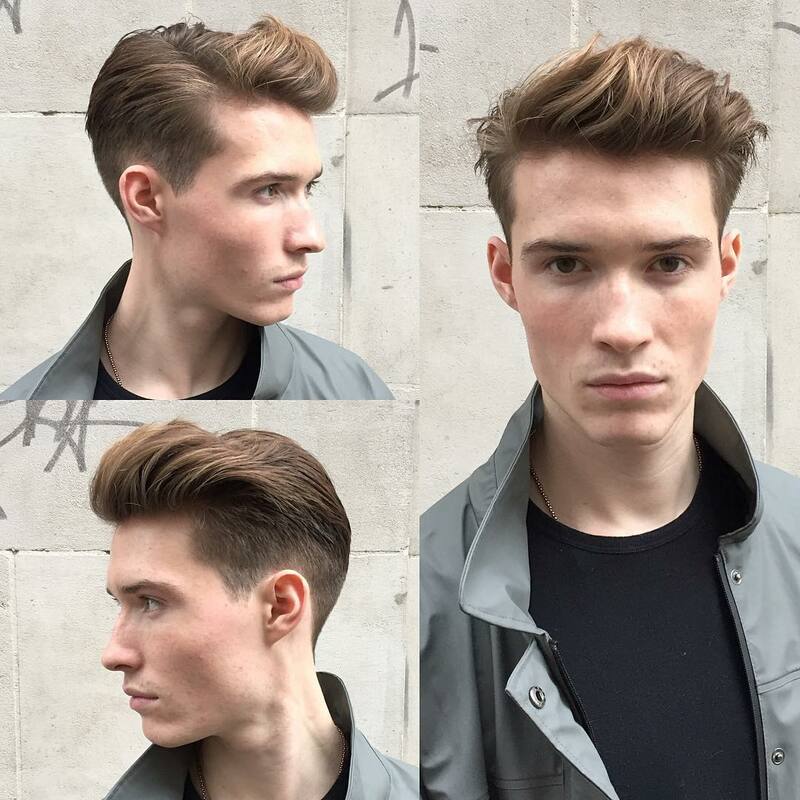 Cool defined textures styled forwards into a quiff. Stellar fade. 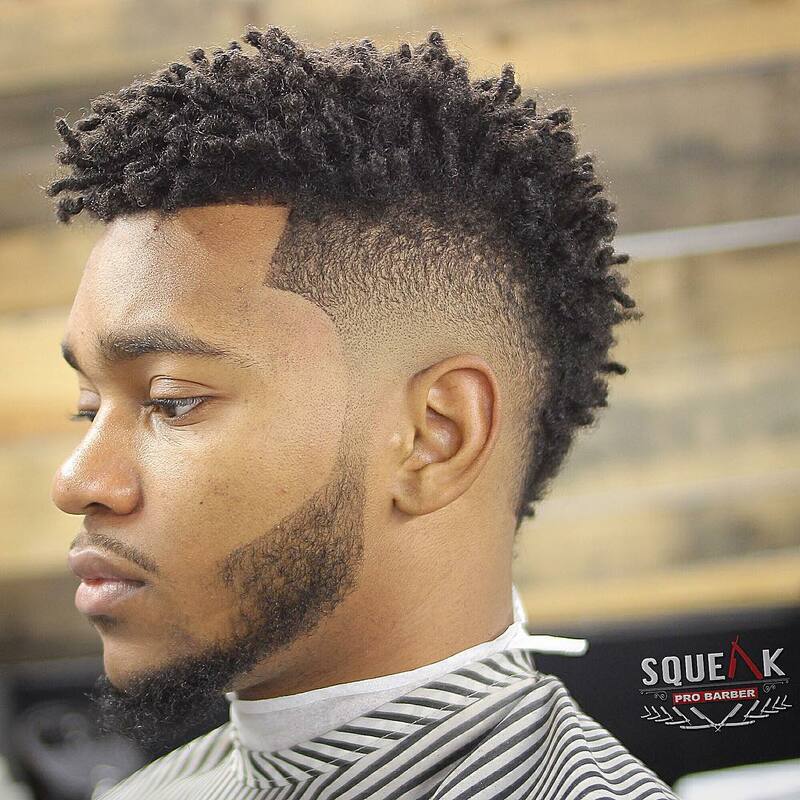 Awesome super clean transition from bald fade to thick perfectly sculpted curls on top. Ridiculous scissor work. 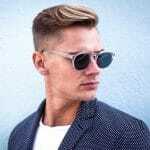 Super cool side part combo slicked back hairstyle. 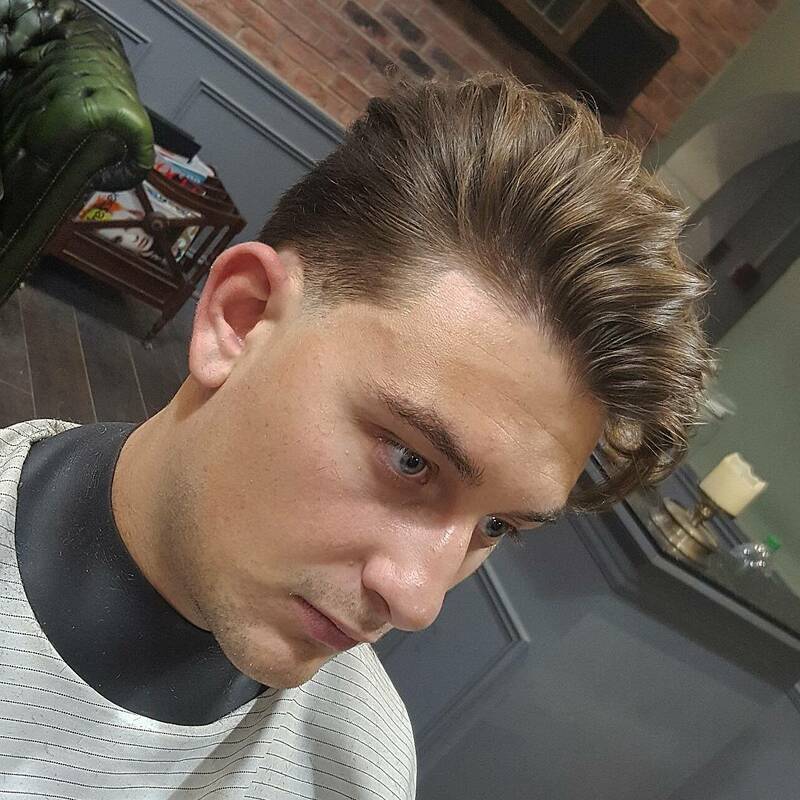 Fine medium length textured hair styled into a quiff. Intense bald fade. 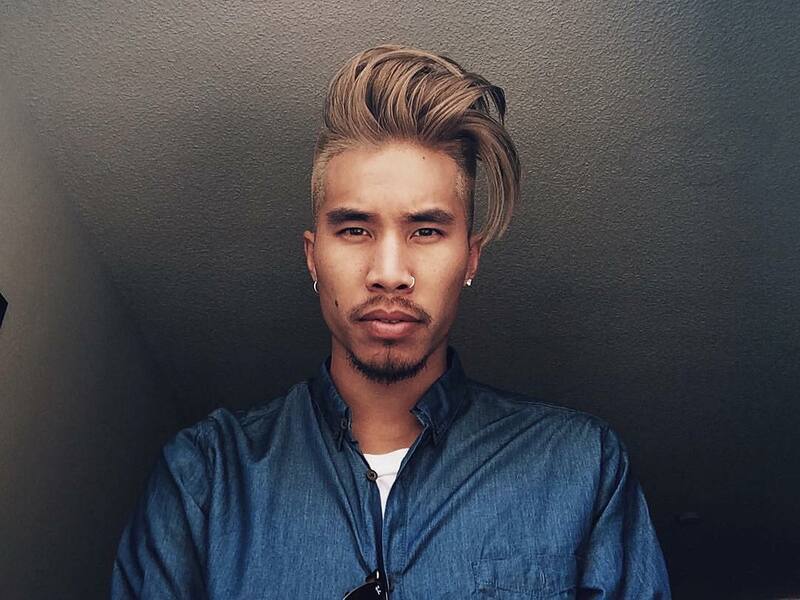 Sick blending skills of the long hair on top into the back and sides. 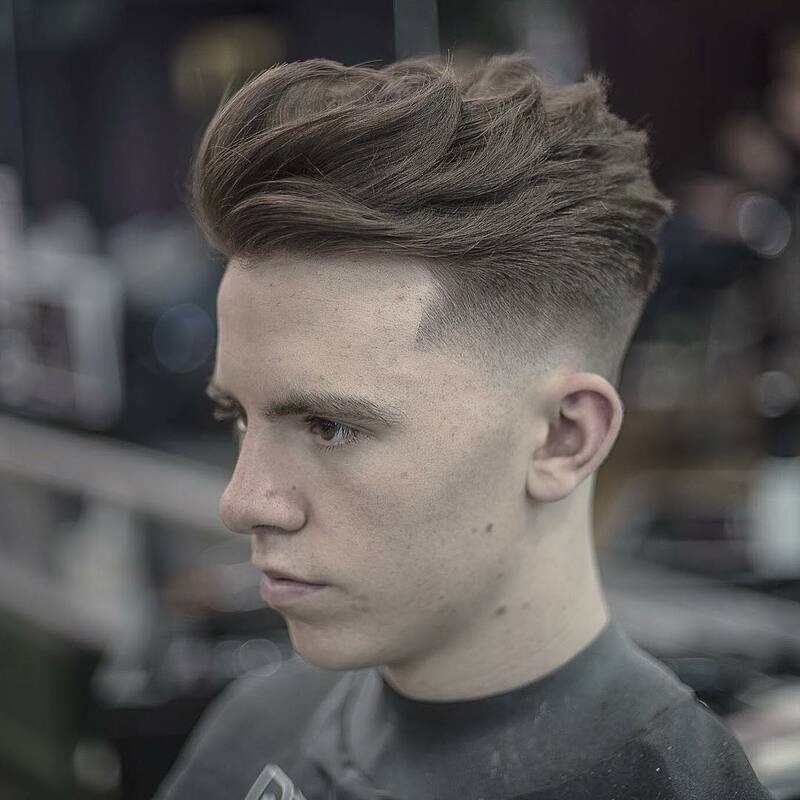 Wild scissor work blending the medium length into the super short sides and back. 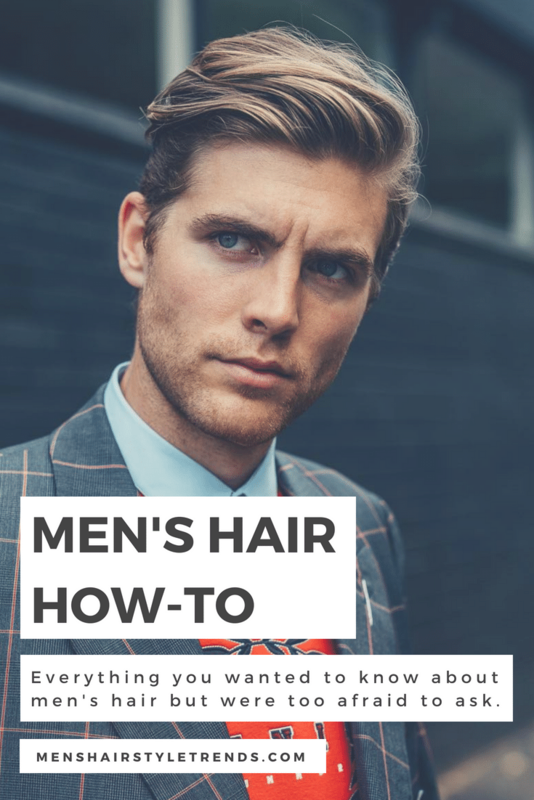 A super easy hairstyle for men. Blow dry, and work textured hair up and forwards. 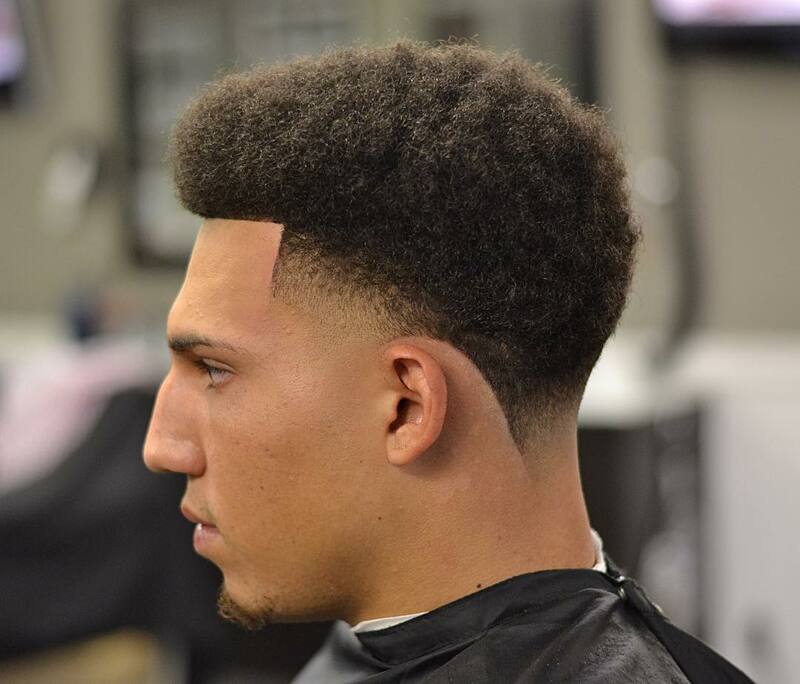 Sick taper fade. Awesome shape. To get this look blow dry with a brush and use a body shaper hair product and hairspray to hold in place. 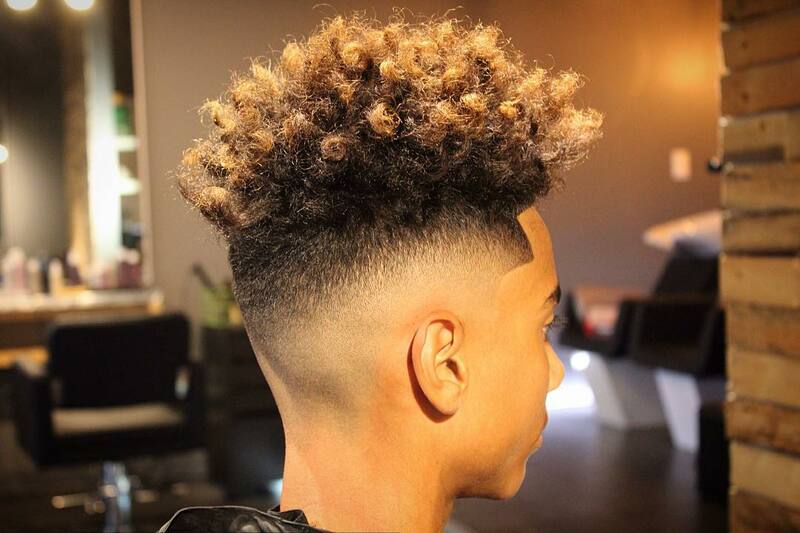 One of the best naturally curly hair cuts of the year. Beautiful work. This is such a wild haircut. There is so much movement going on it almost looks like the flames of a camp fire. 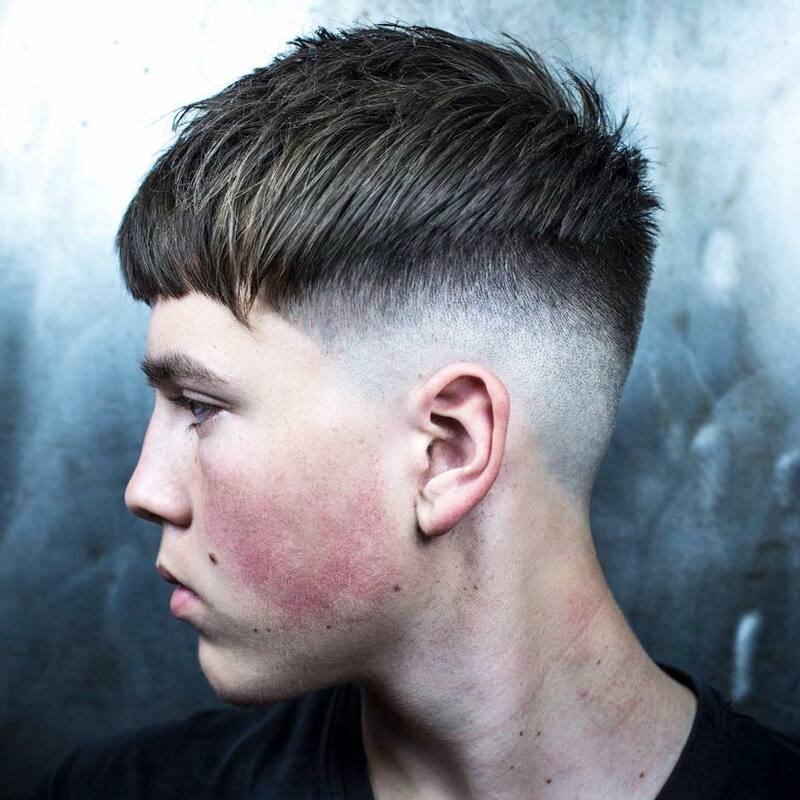 Tonnes of skill shown off in this medium length textured haircut. 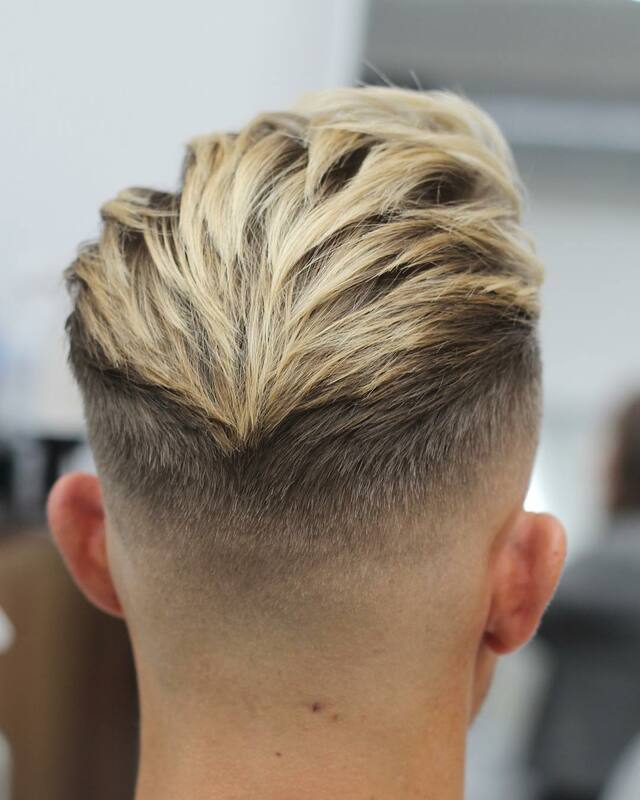 Very clean mid fade perfectly blended into the longer hair on top. 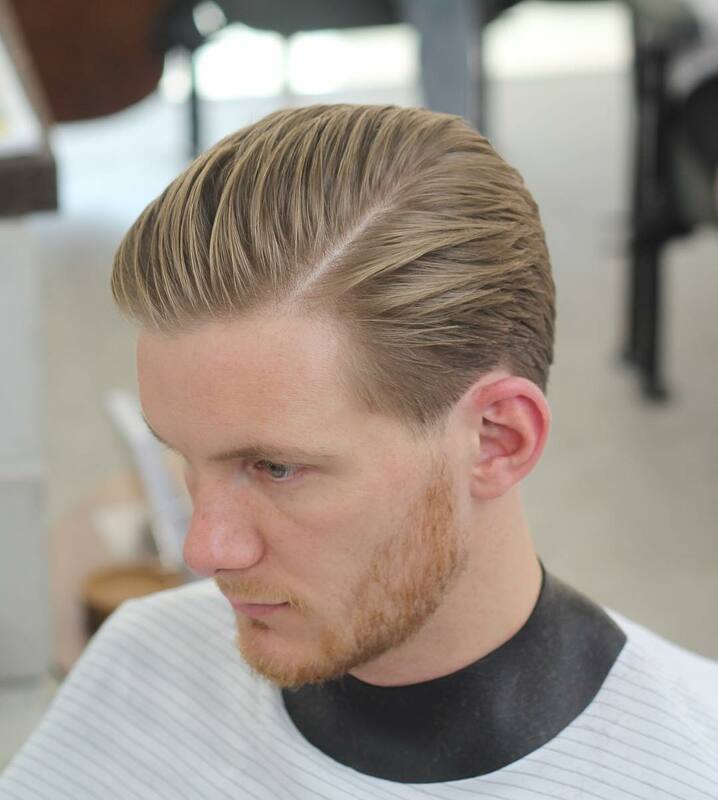 To get the style, blow dry back, brush back, use a touch of light hold pomade. 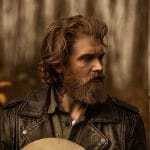 To get this look work a small amount of pomade with shine into damp almost dry hair. No skin here on the sides. You’ll see more and more of that in 2017. 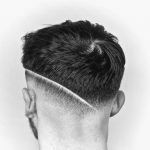 Less high fades, more low fades, less skin, more scissor work. Long curly hair fringe up front. 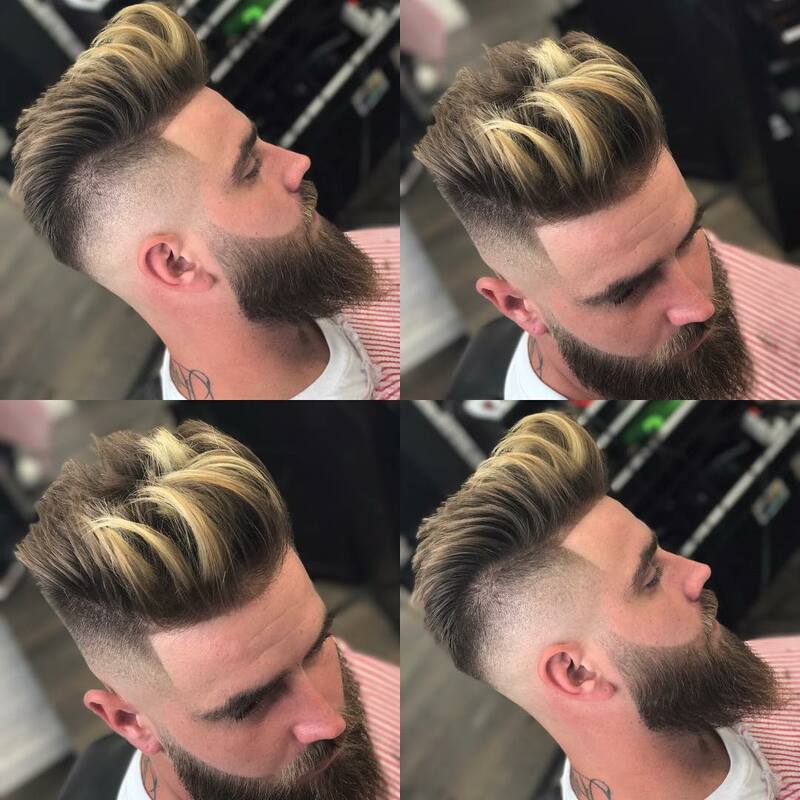 Medium length on top with a high fade. All the movement is flowing forward. 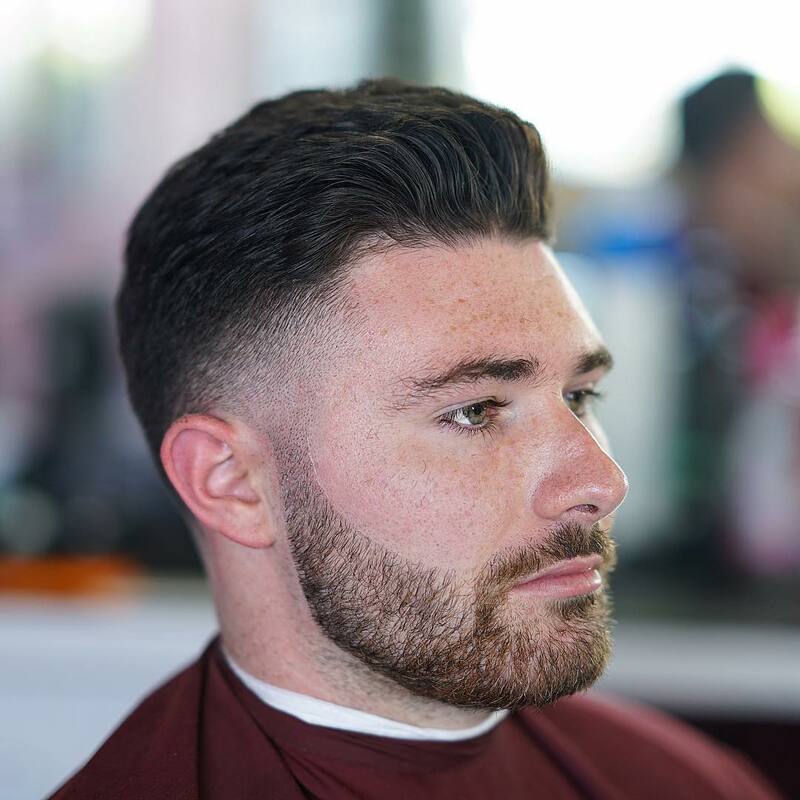 Use a small amount of light hold pomade to help direct and keep the flow in place. 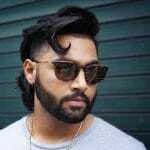 A cool hairstyle for men with thick hair. 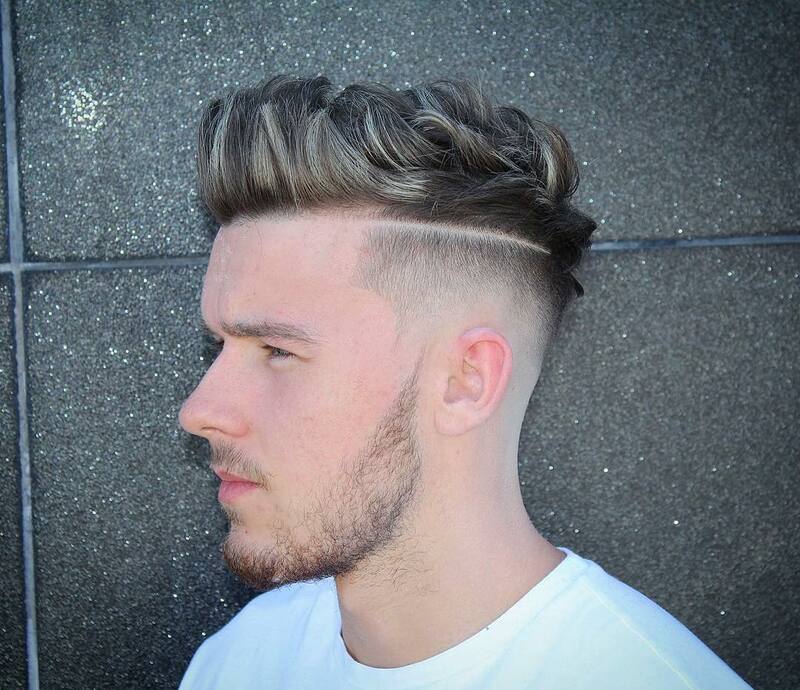 High fade, thick medium hair on top. Lots of extra length in this wavy hair side part hairstyle. Amazing clean blending on the sides. Super clean classic look. 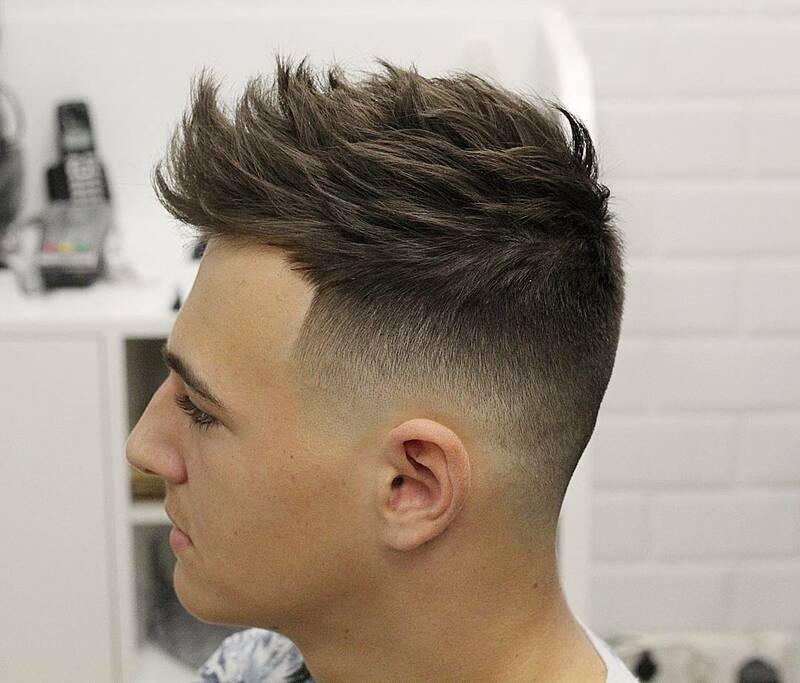 Love the blending going on here with the sides and back into the longer hair on top. Short sides and tall medium length hair on top brushed back. 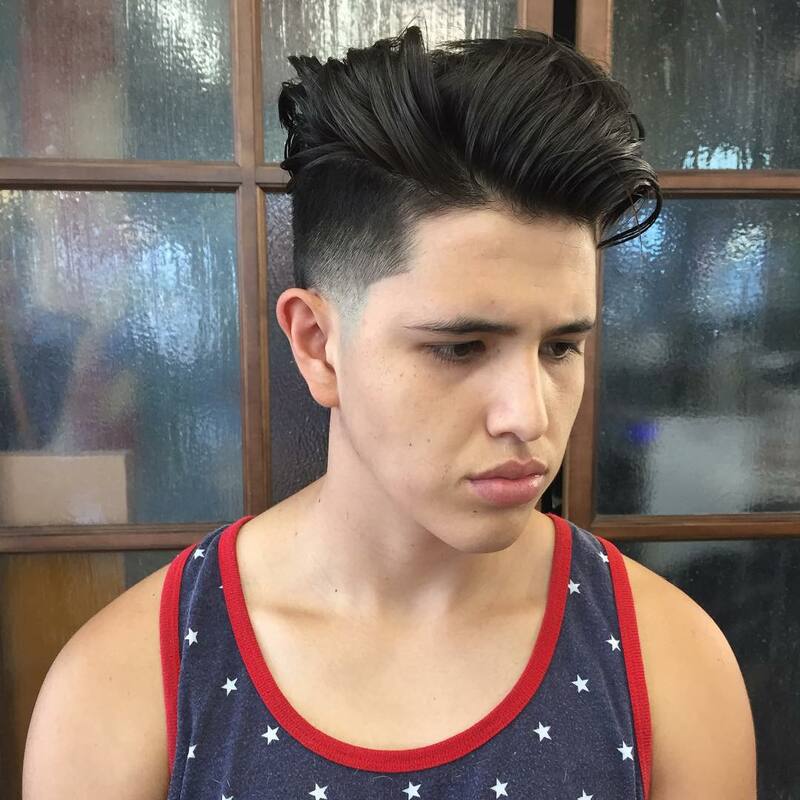 Many of the current styles right now are looking longer in length and feature very natural flow and movement. 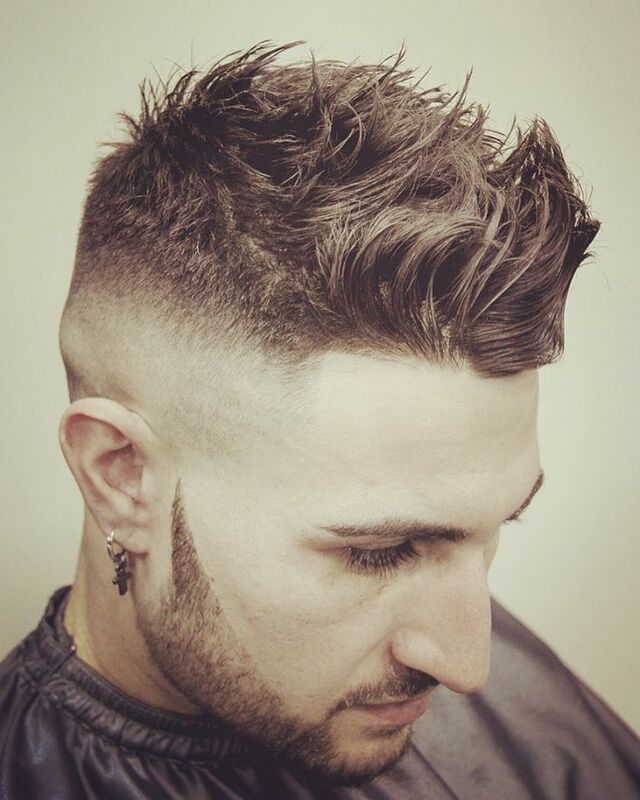 Half length hard part, super clean skin fade. Medium length natural curls on top look super slick. Such a clean and precise cut. So short and so clean on the sides. Cool bald fade. 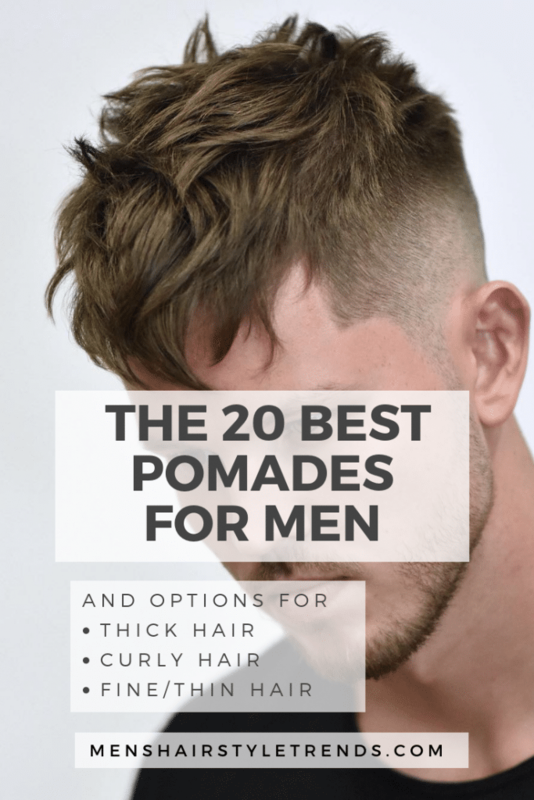 Hair on top is brushed into a slicked back pomp. 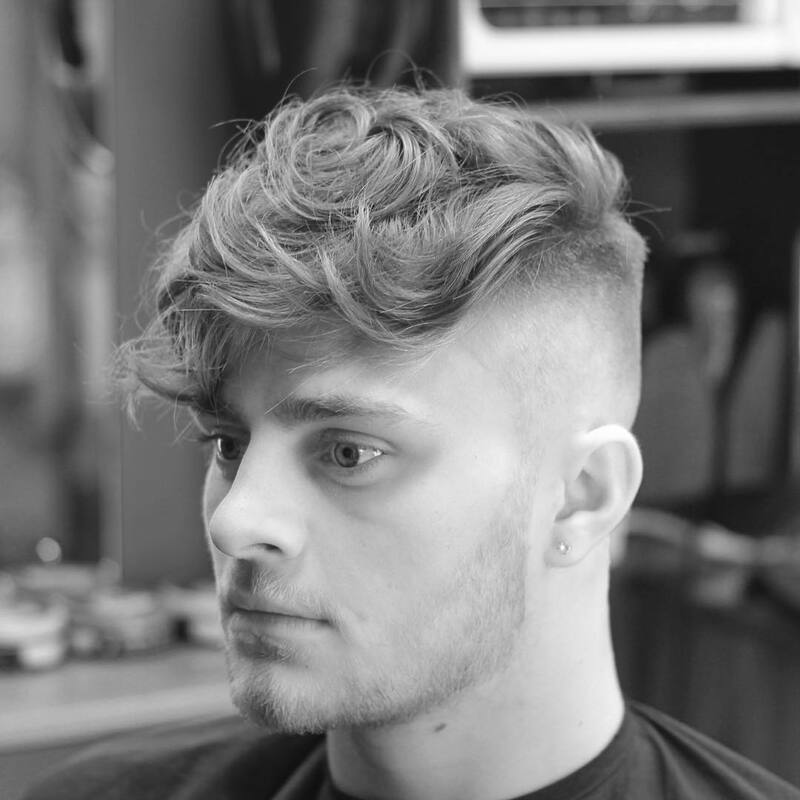 Thick textured hair on top with a mid fade. 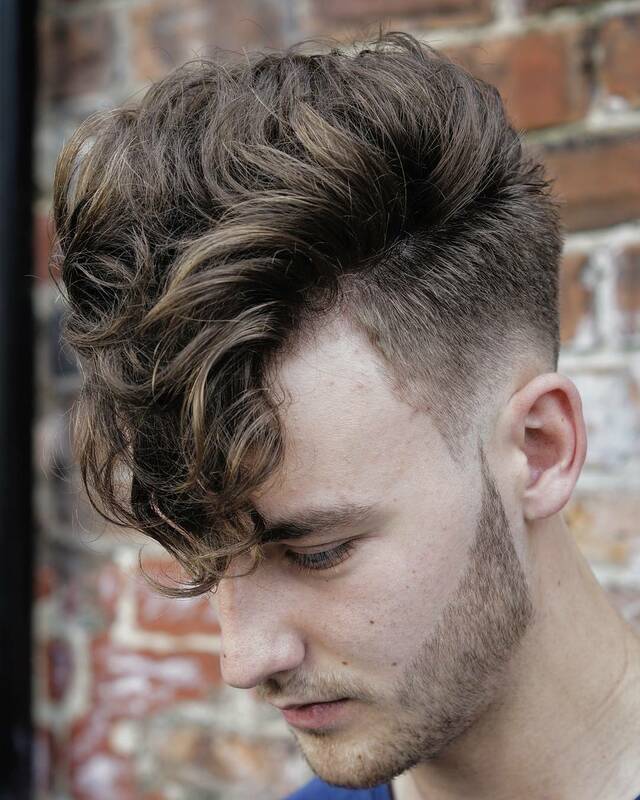 Super cool men’s hairstyle for curly hair. 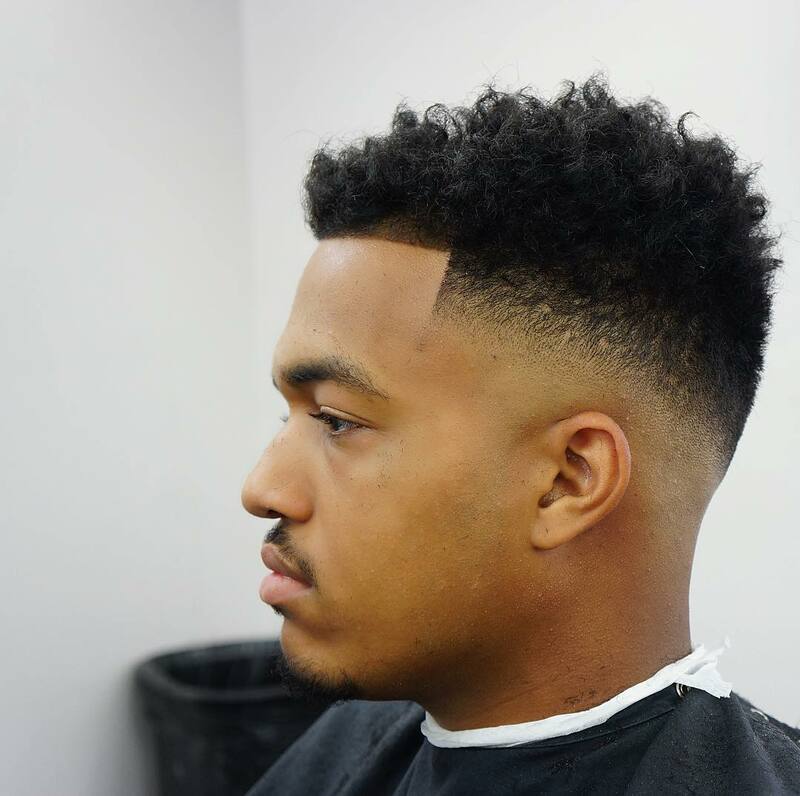 Super clean mid fade with medium length thick hair on top. 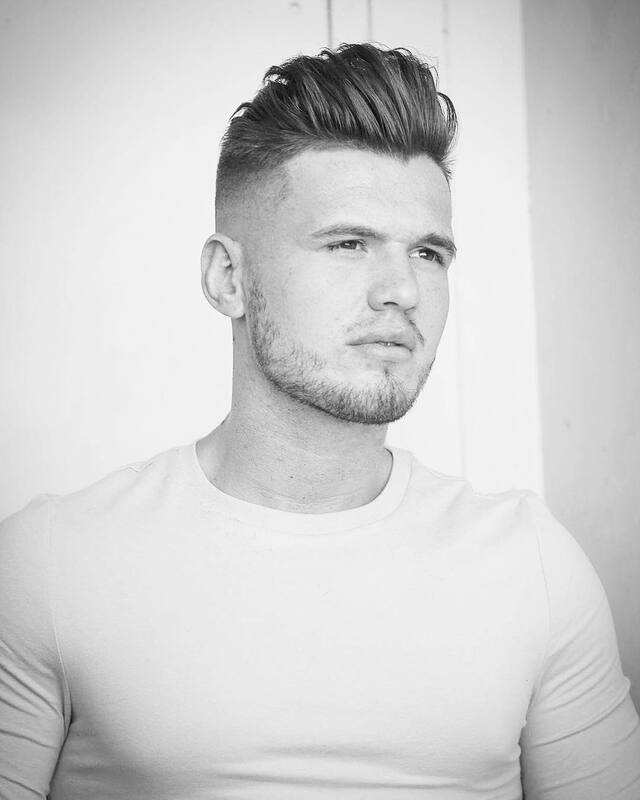 Low fade, medium naturally curly hair on top with a long fringe in front. 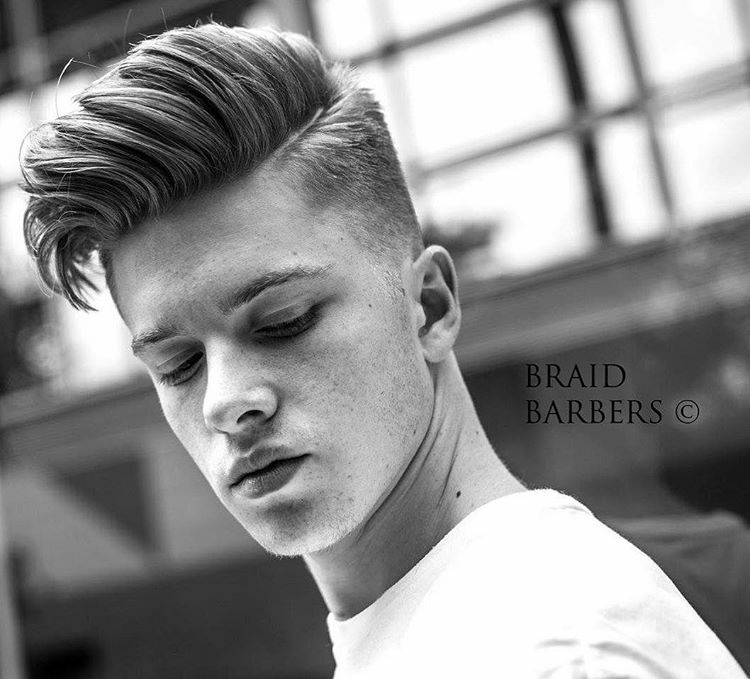 A medium length undercut slicked back and combed nicely to the side. 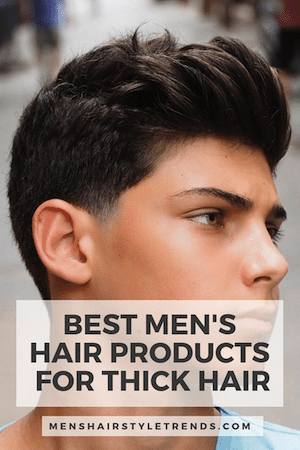 A great look for thicker hair. Totally sick. 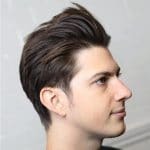 A classic medium length men’s side part hairstyle. But the way it has been cut gives some incredible definition in combination with the combing direction and technique. 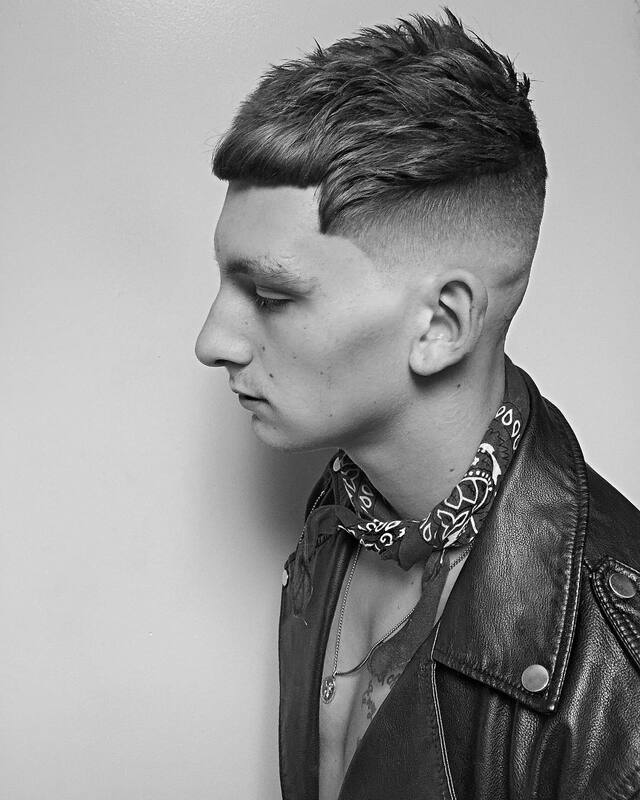 A modern man’s classic haircut. Medium length textured hair with longer fringe. Blow dry to get your volume. 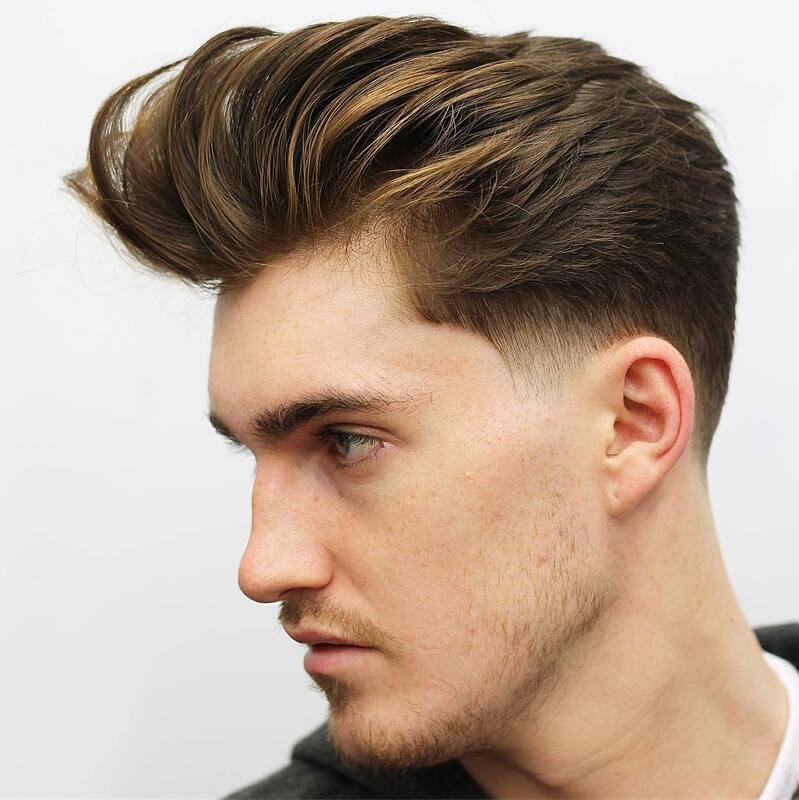 Use a very strong hold pomade to keep the hair on top looking tall. 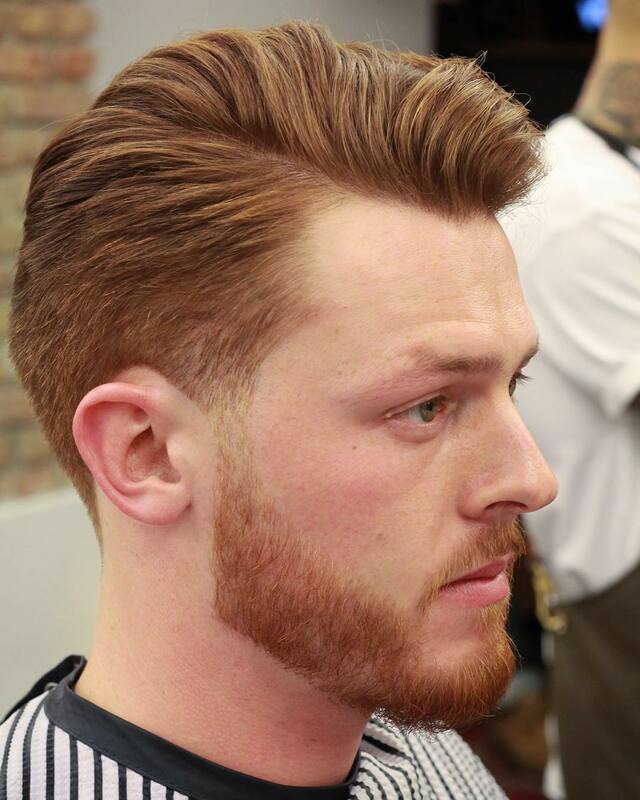 Cool pompadour hairstyle for men with some awesome flow going on. Dig it. Longer thick hair brushed back in 2 sections. All natural. Scissor cut clean but keeping a long length on top. Blow dry, brush and go. As cool as cool gets. 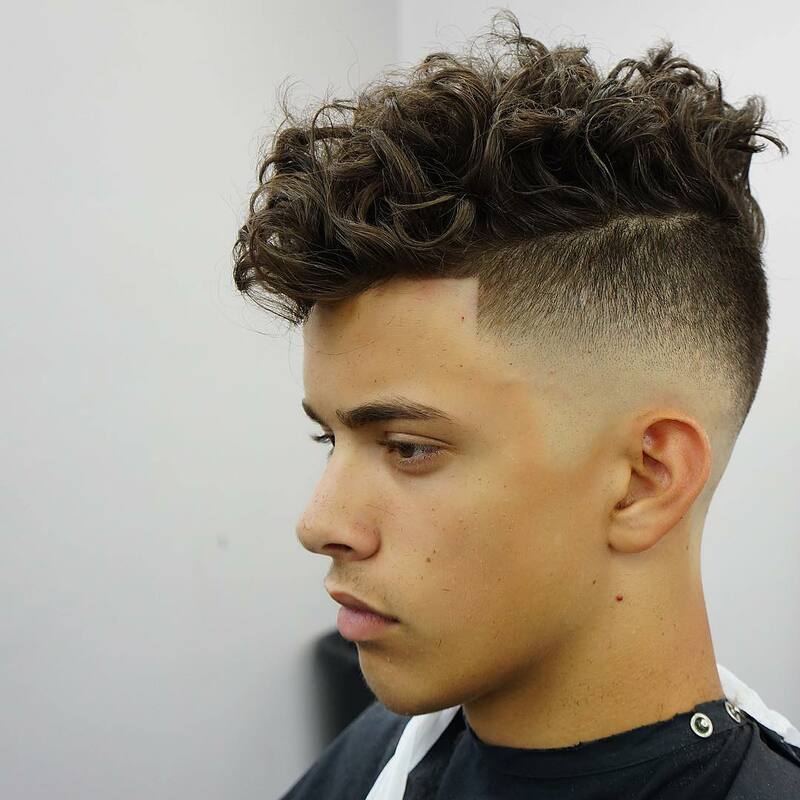 High bald fade with awesome thick long curls on top. Nice and short on the sides and back. Keep it long on top and brush it back. This is really a slicked back hairstyle but it looks dry. 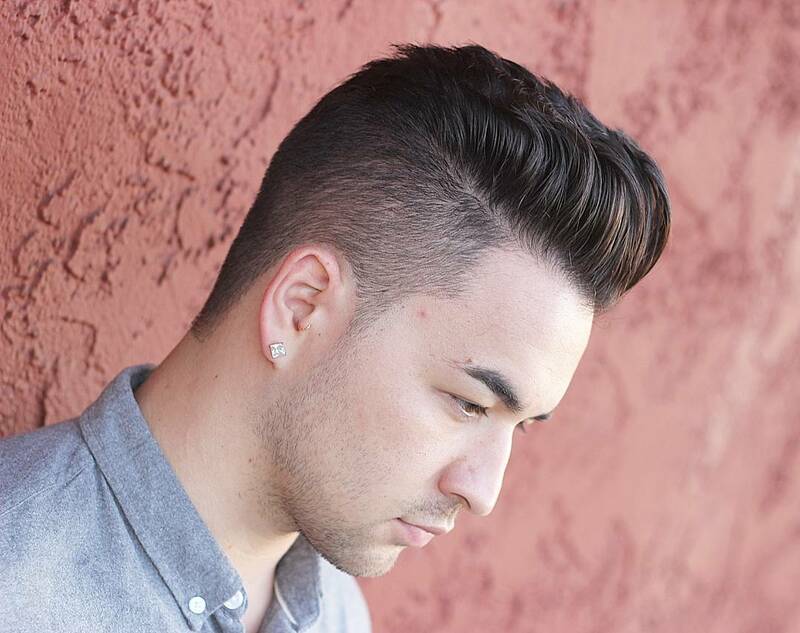 Use a matte finish pomade to hold your hair back. Comb or brush into sections. 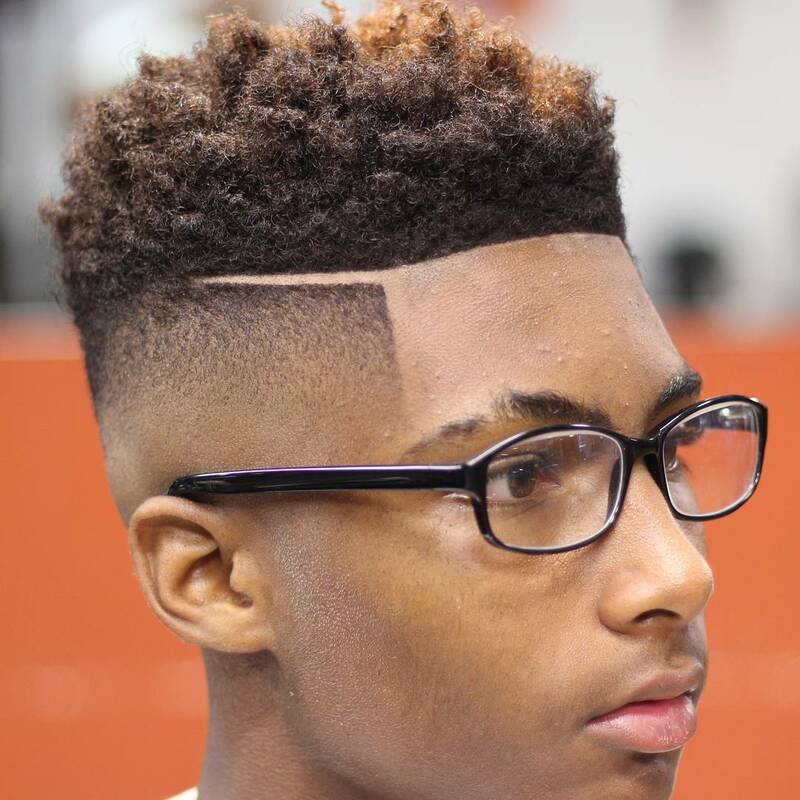 Flawless fade. To get this exact look you will need thick hair or a lot of finer hair to get this kind of volume. 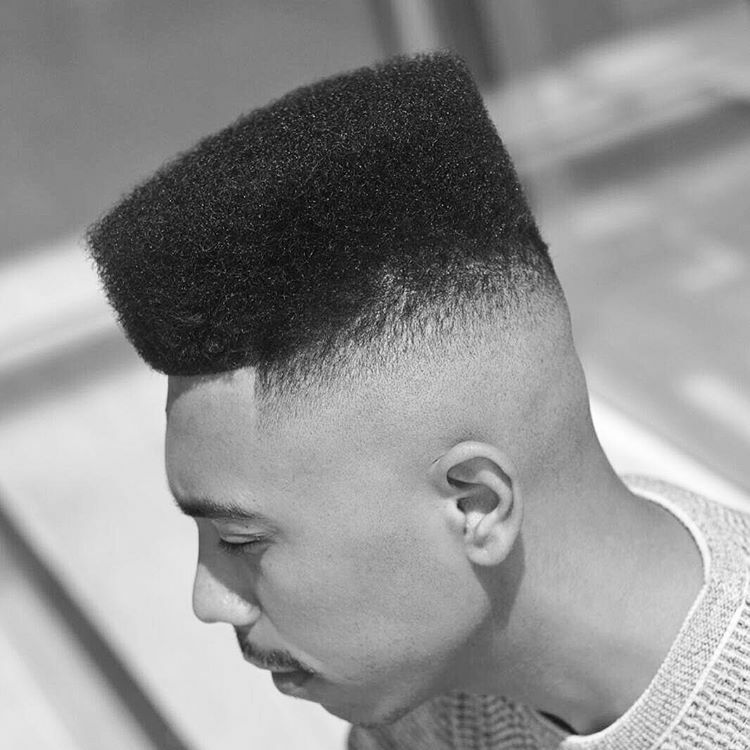 Killer flat top and super high bald fade. Sick AF. 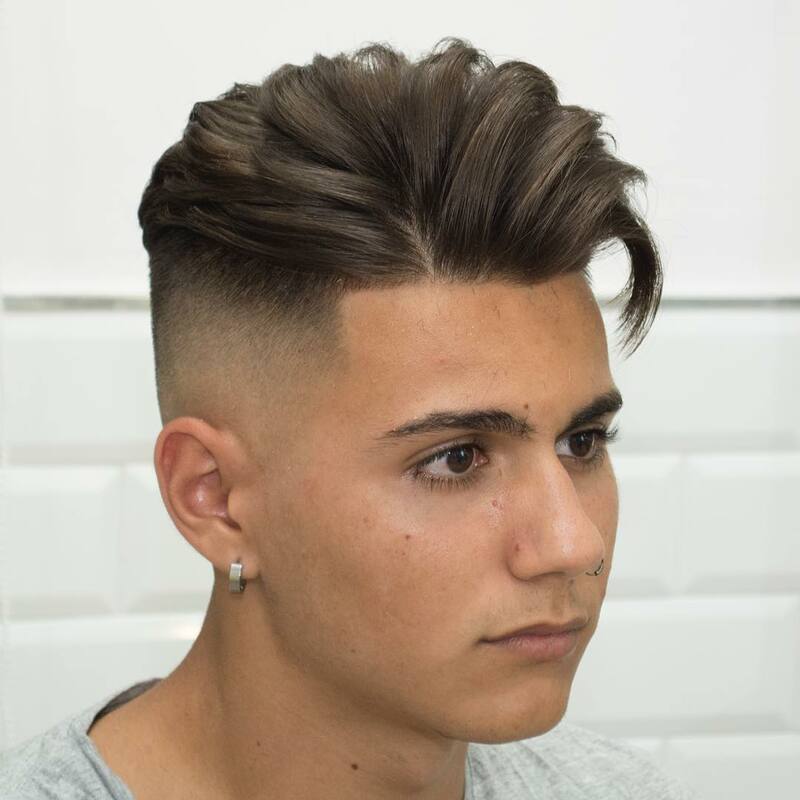 Cool side part hairstyle with longer hair. 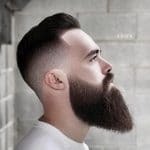 All scissor cut aside from the beard disconnection. 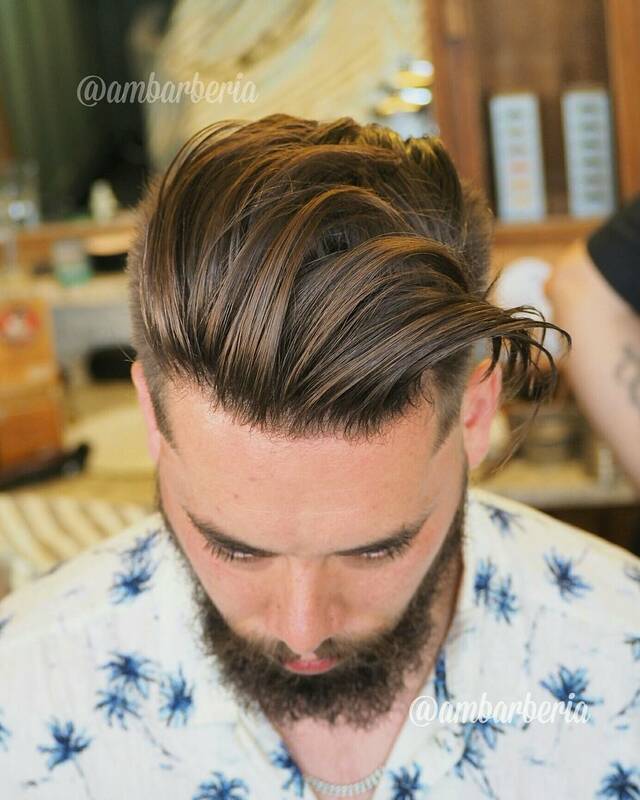 Blow dry, brush, use a small amount of medium hair pomade and work into your hair. 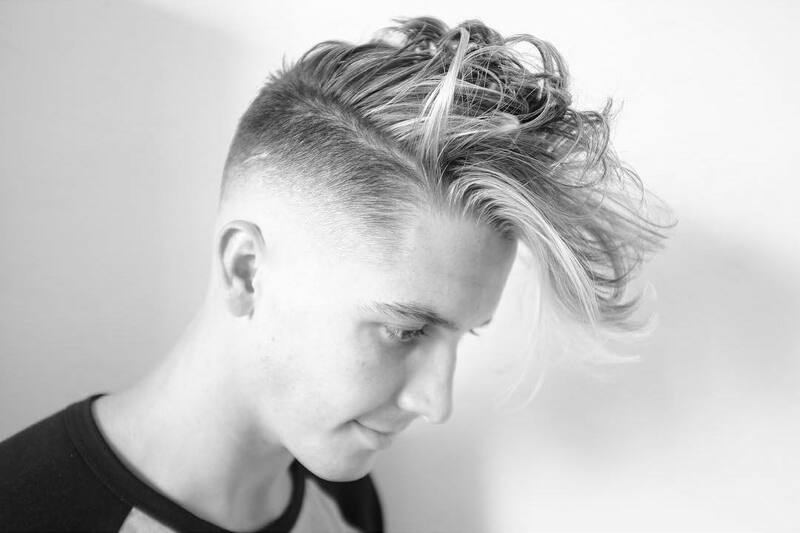 Disconnected undercut with longer hair. Blow dry your hair back while brushing. 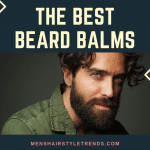 Use a small amount of medium hold pomade. Matte finish or one with shine works. It’s good to have 4 or 5 different types of pomades kicking around that have different hold strengths and finishes. It might cost you $100 but it will last you almost the entire year. 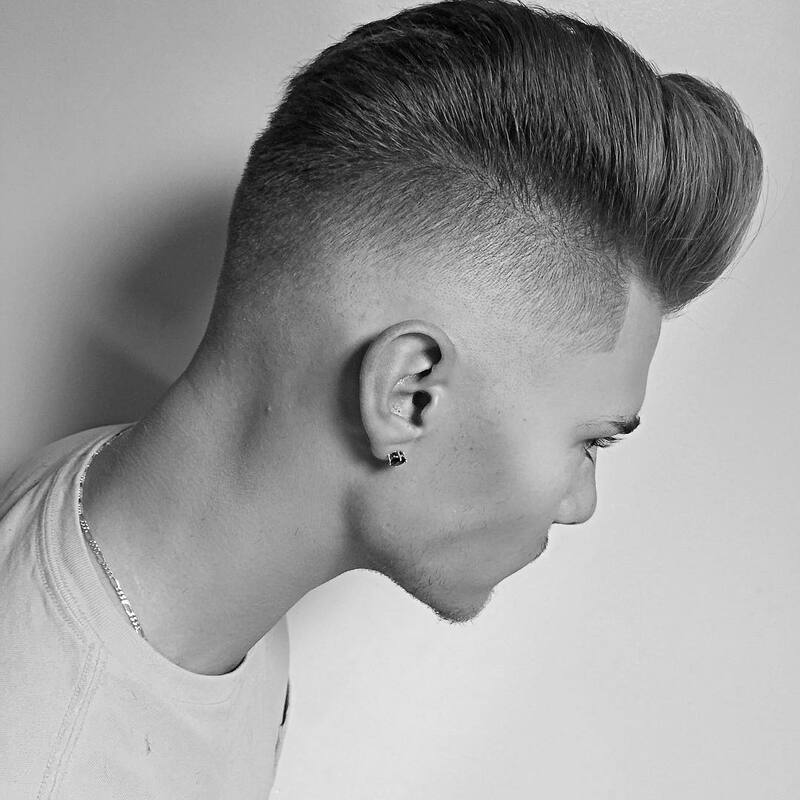 Cool undercut pompadour hybrid haircut. Amazing detailing. 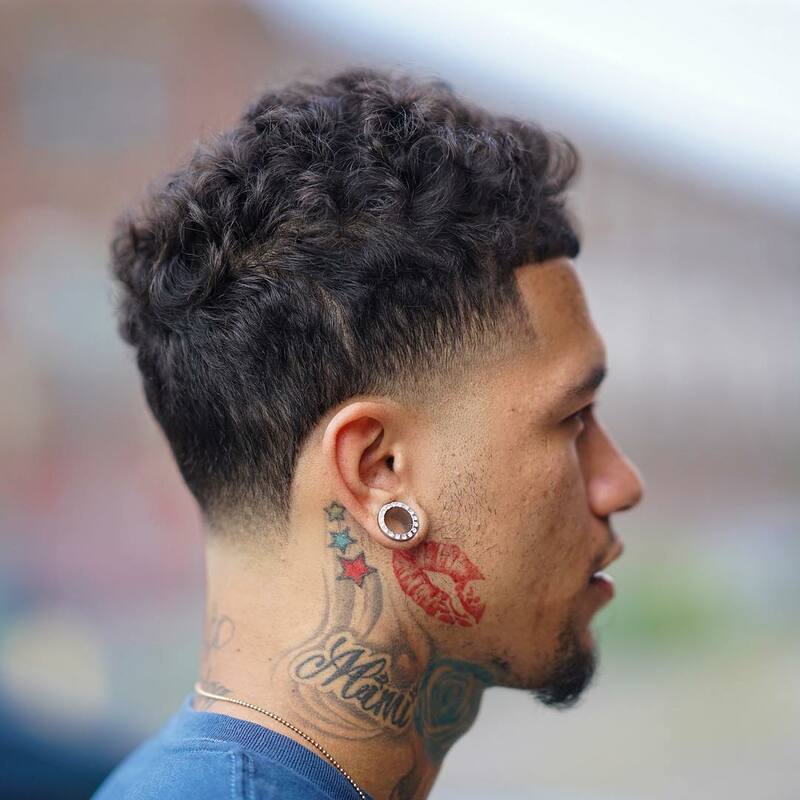 Super clean taper with long curly hair on top. 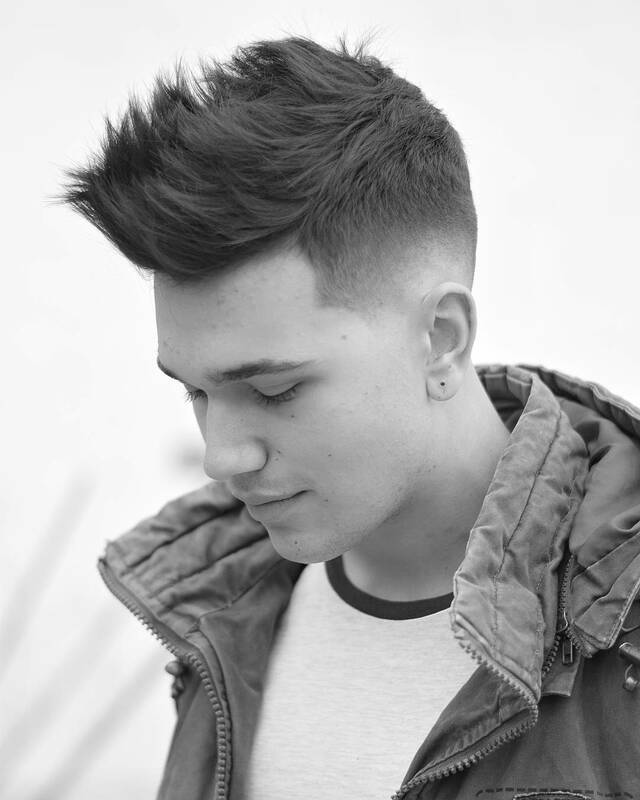 This haircut works well with thick hair, and wavy hair too. 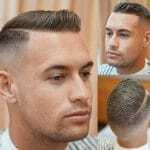 Cool, low maintenance, longer hair hairstyle for guys. 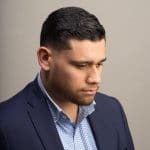 This style works for fine hair, thick hair, pretty much all hair types. 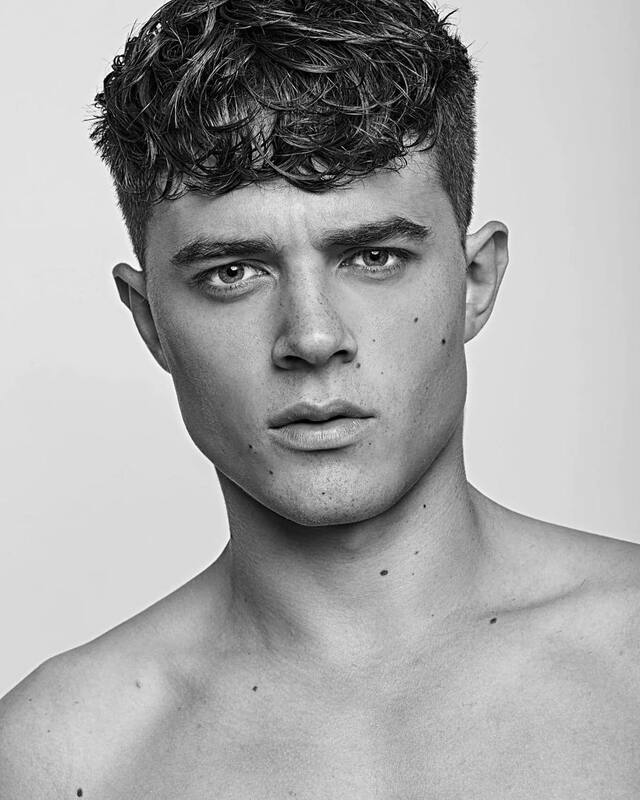 If you have thick hair, whether it is coarse or fine, or curly hair you have to get this look pronto. Totally rad. 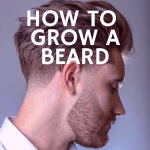 Just grow it out now and in 3 months or so you can pull it off. Hair on top is left all wild. Nice and short on the sides and back. Many of these hairstyles with longer fringe or bangs draw inspiration from the 1980s skater looks. Lots of cool flow happening here. 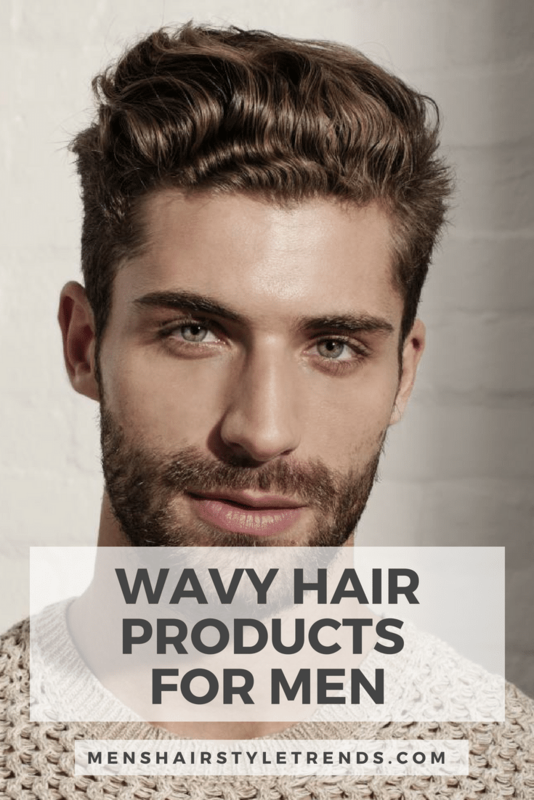 If you have thicker hair, curly hair, or wavy hair you can pull this off. 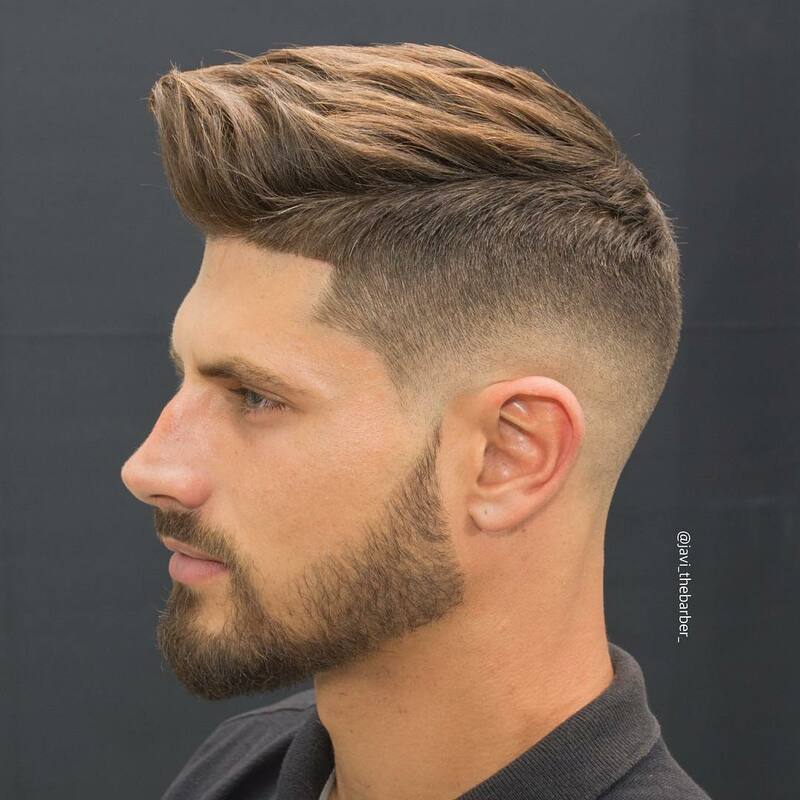 Clean high fade, long fringe, longer wavy hair on top. Just towel dry or blow dry and let it go loose all natural. 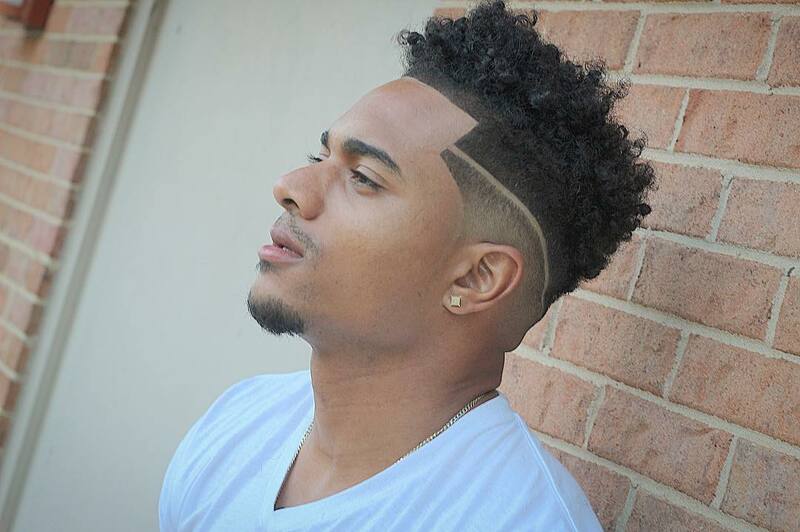 This is super dope long hairstyle for men. 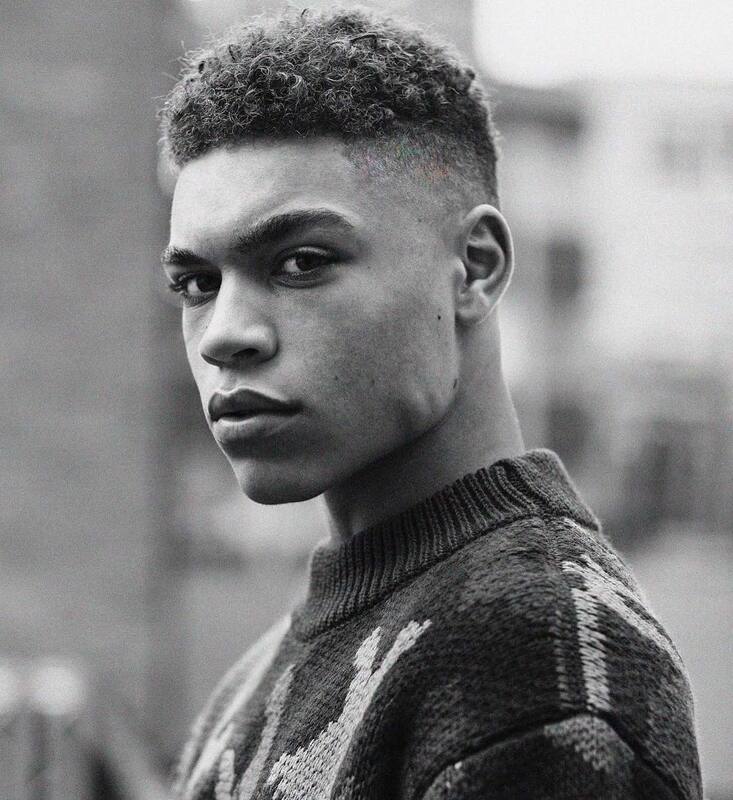 Awesome super clean bald fade, and long messy but neat hair on top. 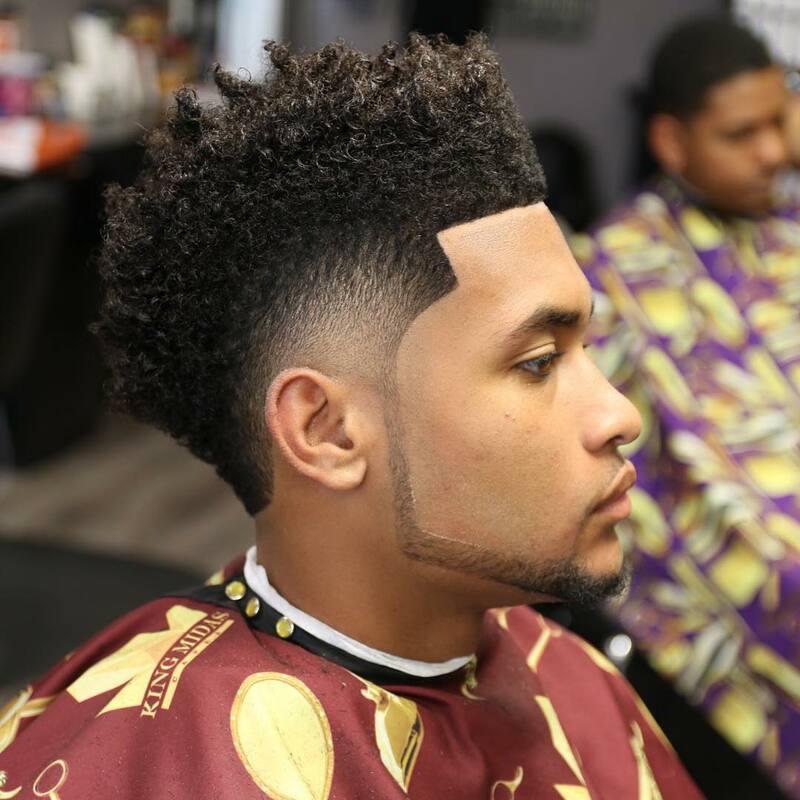 This is an all natural scissor cut hairstyle for men. The long fringe or bangs makes this look complete. Blow dry, side part. Use a bit of product if you like. Light hold pomade. A classic look in a long length of hair. Sides are cut short but not faded to the skin to allow for the side part. To get this look, first briefly blow dry your hair while brushing in the desired direction. Stop while your hair is still damp or not fully dry. 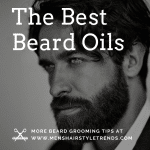 Use a stronger hold pomade with some shine and work it evenly into your hair with your. Don’t use too much. Use a large tooth comb and comb your hair into place. 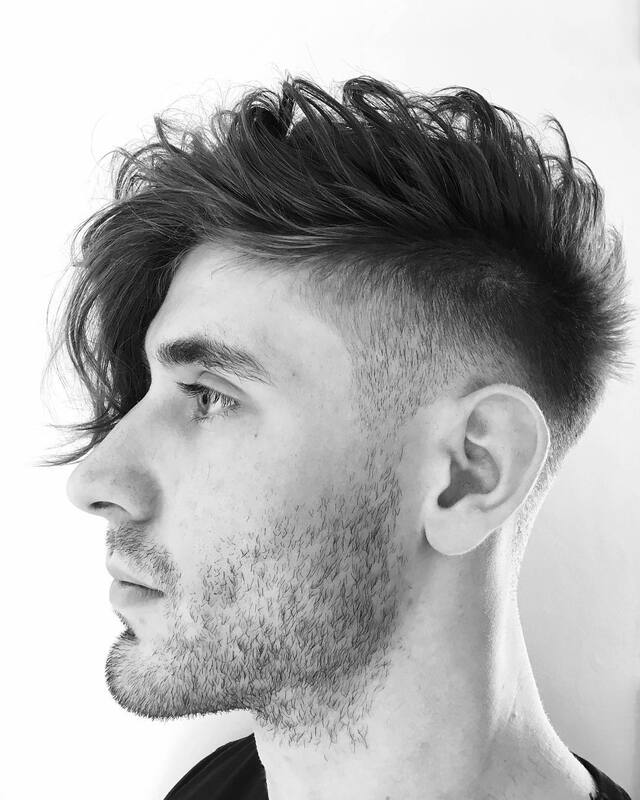 A cool undercut hairstyle with a super long fringe. Hair is simply brushed back and to one side. 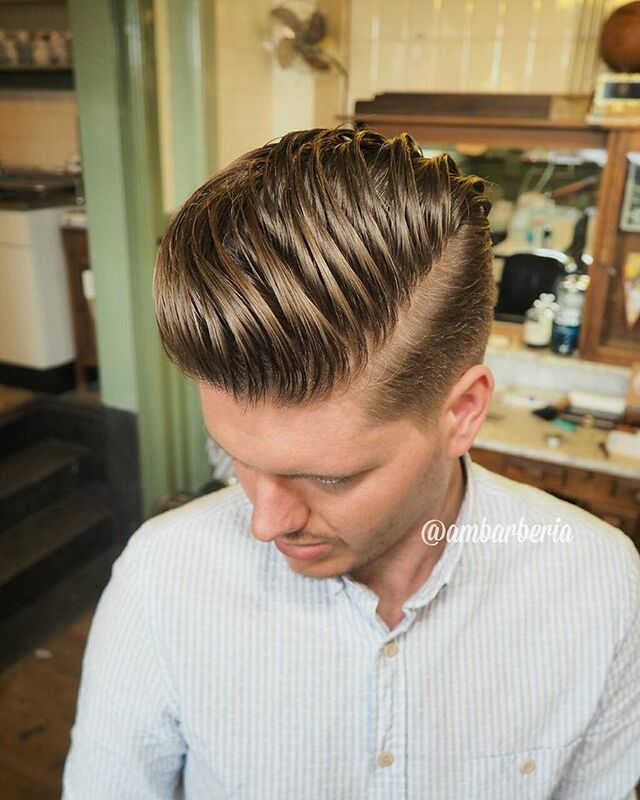 You can use a medium hold pomade to keep that volume alive in the front. Hair is styled in sections back and to the side. 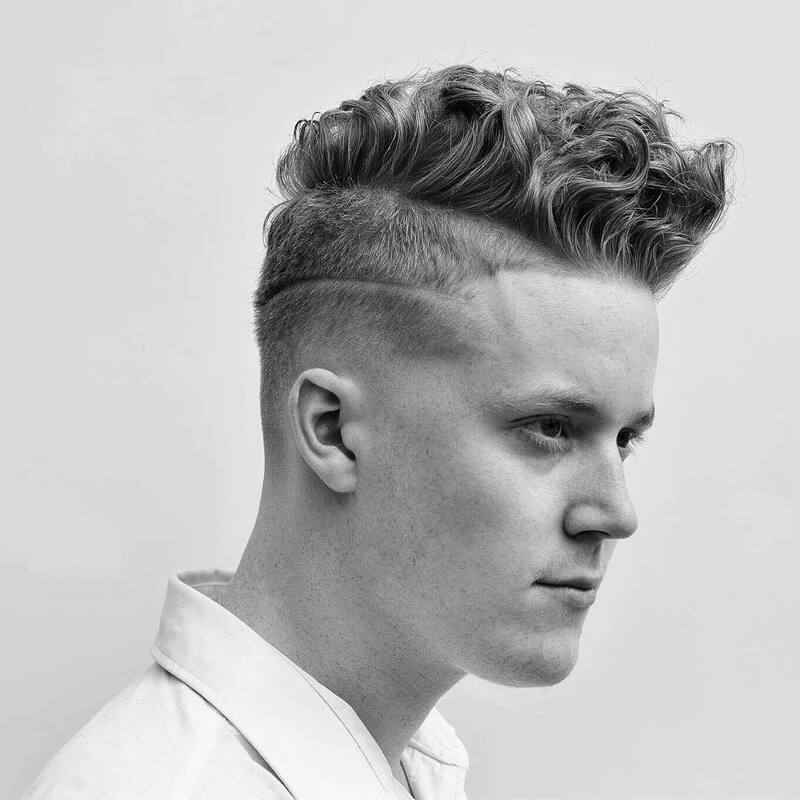 A modern day undercut. Hair is grown out and styled or brushed straight back. 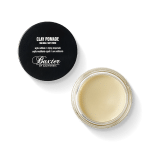 Use a lighter hold matte finish pomade. 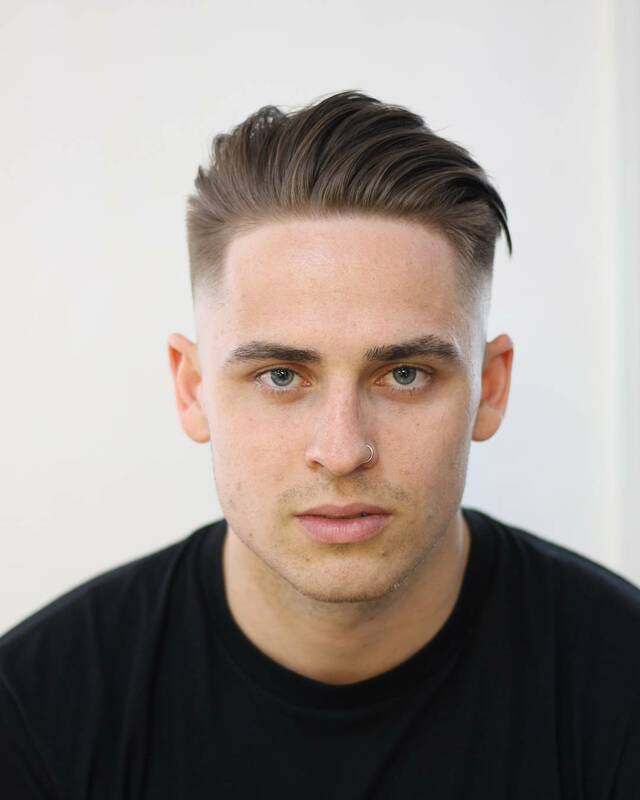 We saw a tonne of these hi-lo fades and hard parts the past few years but mostly with shorter hair. Here we are at the end of 2016 with some similar ideas and execution but with long wild textured hair on top and a long fringe in the front. Very cool haircut. Pretty wild flow but it looks rad. This is a another great look if you have thick wavy hair. 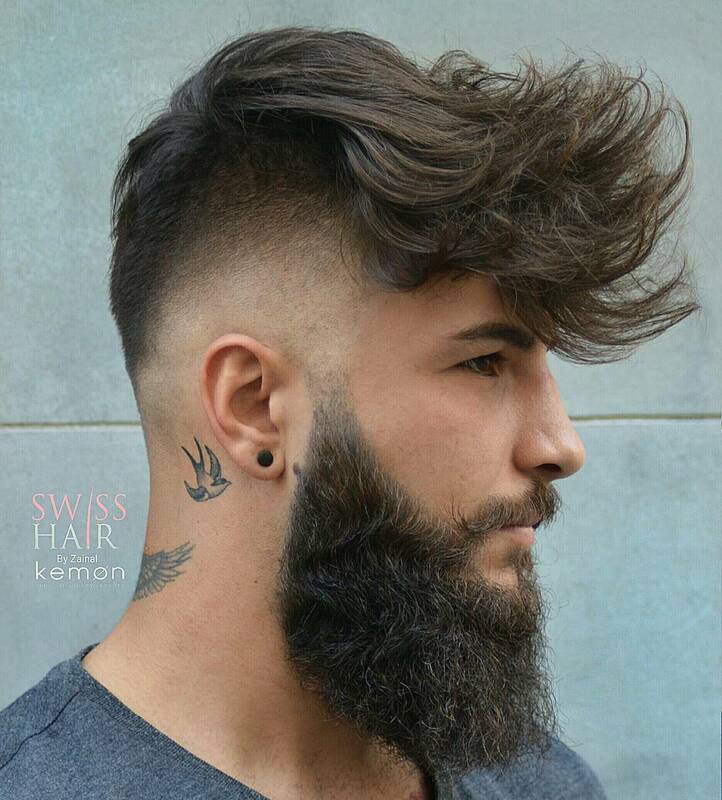 It features a high skin fade and a disconnected big beard. Long hair on top is also abruptly disconnected. Just towel dry and go. Another amazing natural look. 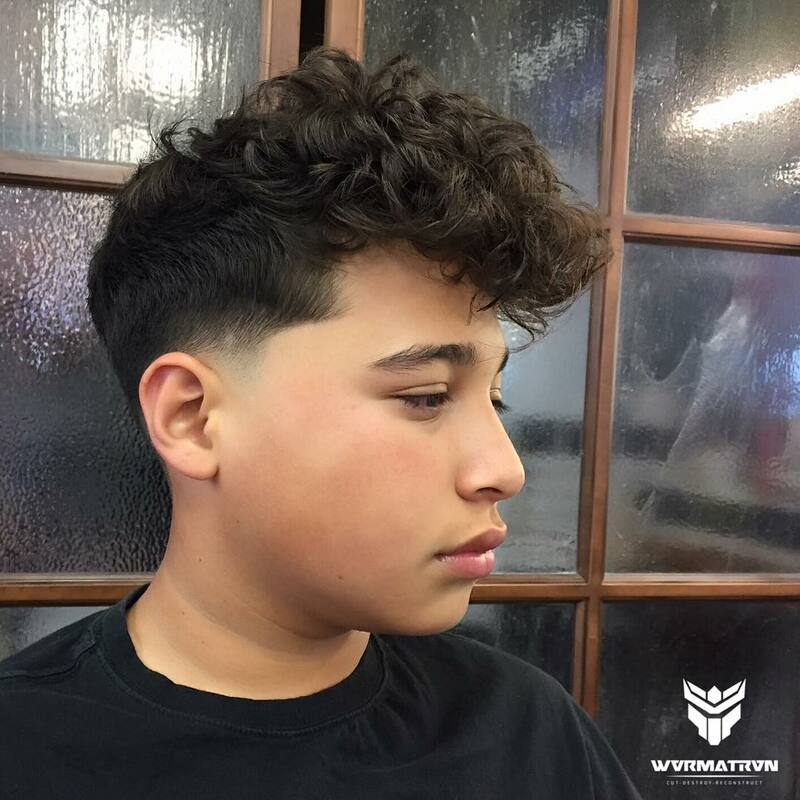 Nice clean mid fade with long wavy hair brushed over to the side. To style this look blow dry first to get some extra volume in your hair. Brush into place and leave as is. 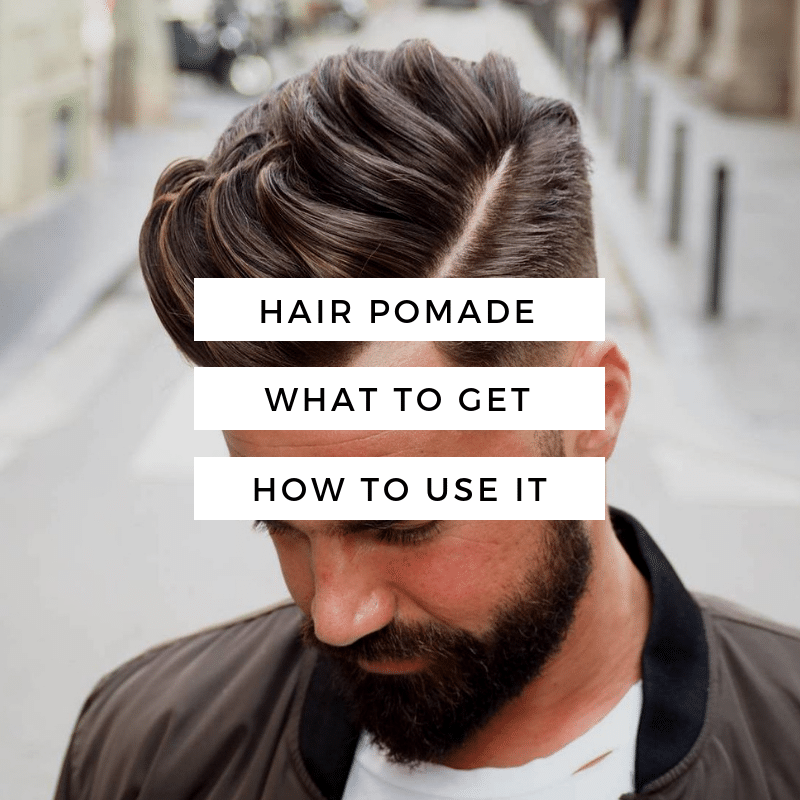 Or, work a small amount of medium hold pomade evenly into your hair in the direction of flow you want. This look is awesome if you have thick hair or curly hair. A super clean well blended mid fade and disconnected beard. Hair on top is left to do its natural thing. 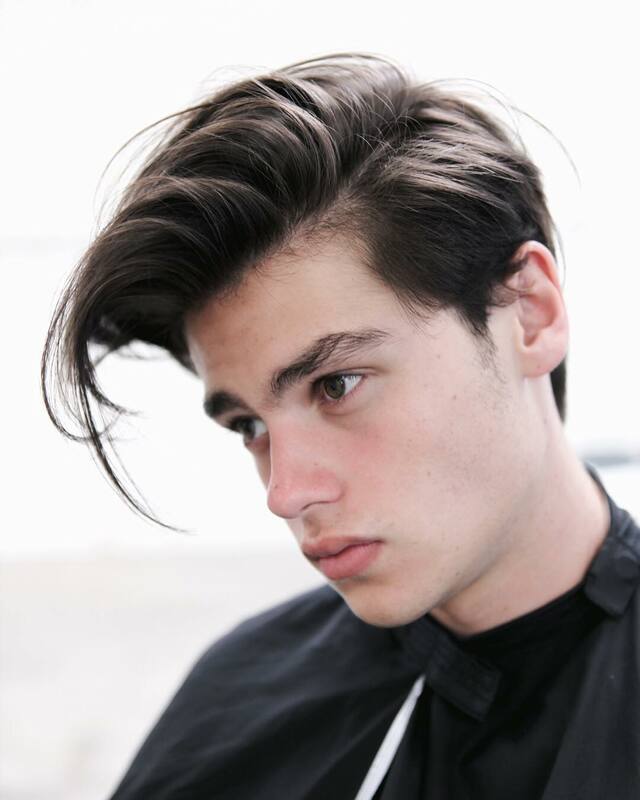 A really cool looking men’s hairstyle for long hair. 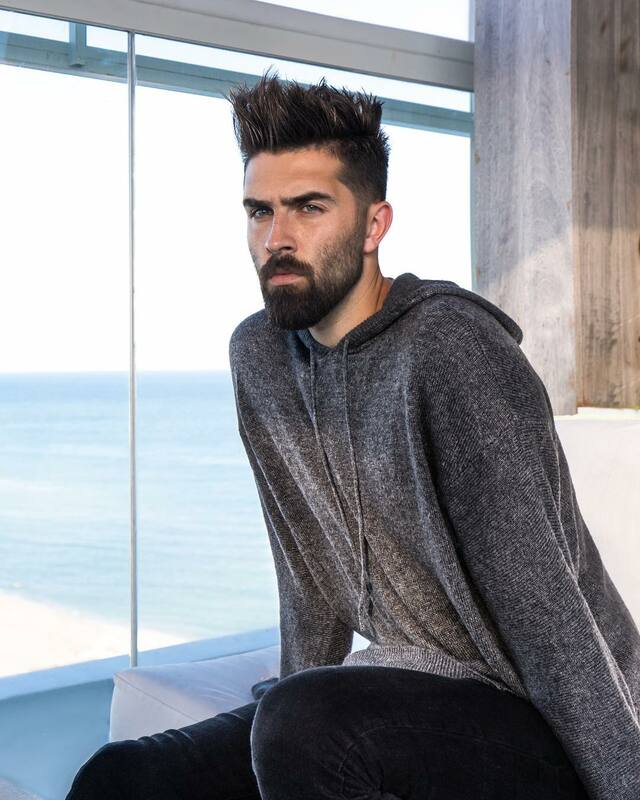 The long hair contrasts with the temple fade and well groomed beard. 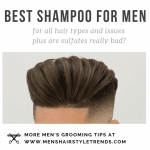 So there you have it, a complete guide for the best men’s hairstyles for 2017.